You guys, we are in the home stretch! Christmas is a mere 8 days away. 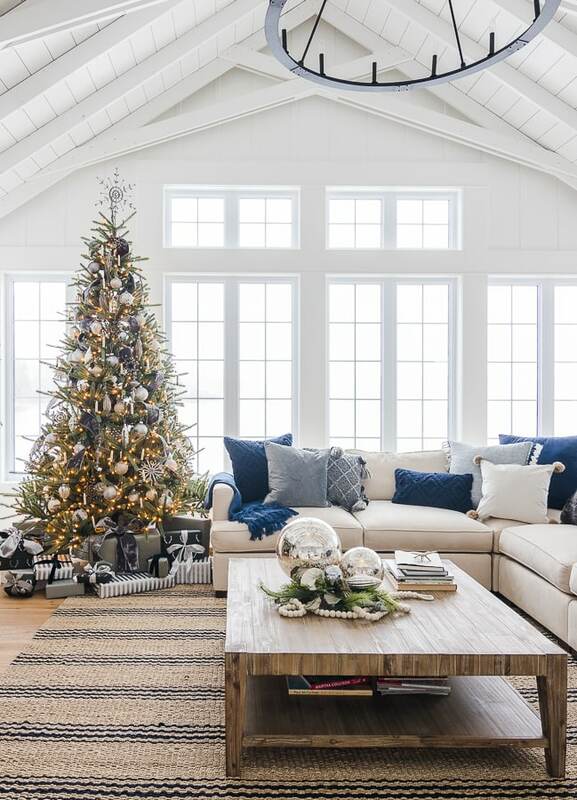 If you procrastinate (like me), you may be on the hunt for some last minute gift ideas or you are wanting to cozy up your own home before your family arrives. 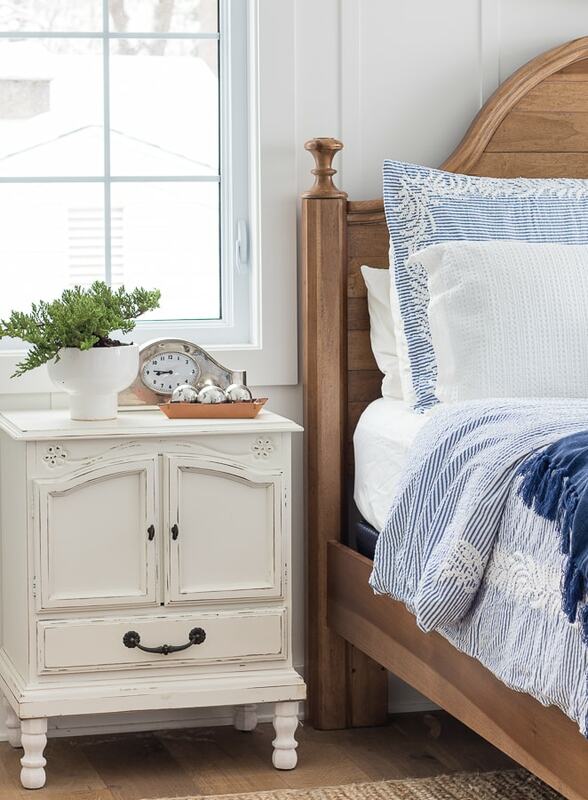 Maybe your guest room could use a good sprucing? 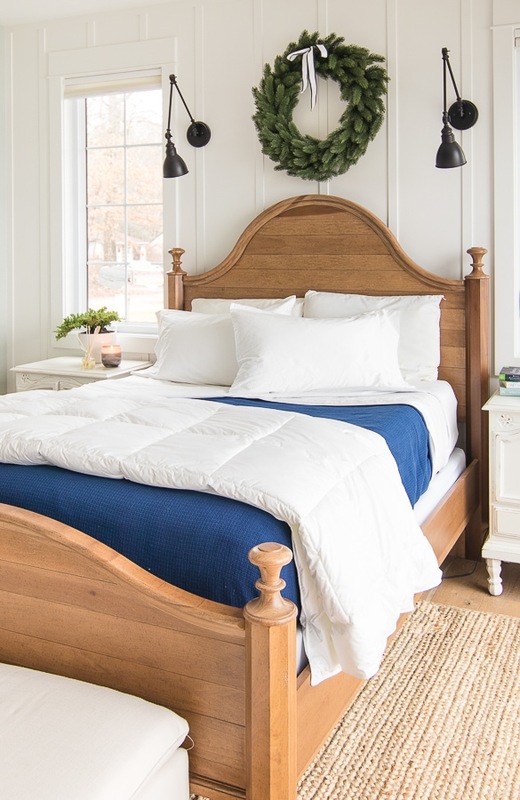 Well, I’m partnering with The Company Store to share a few of their warm and cozy products for bedrooms, and the good news is that they offer free guaranteed Christmas delivery when you order by 10 am Dec. 21st ET! 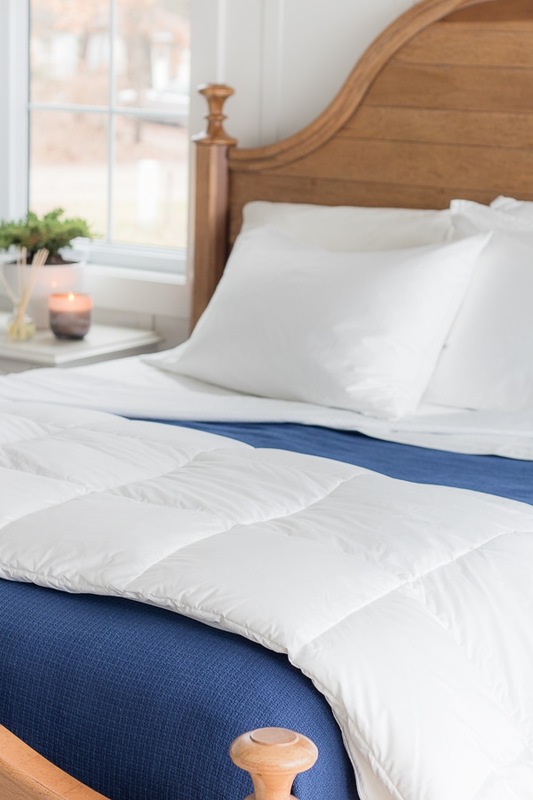 I think new sheets and comforters make the perfect gift for Christmas, because now is the time when we need an extra cozy layer or two. 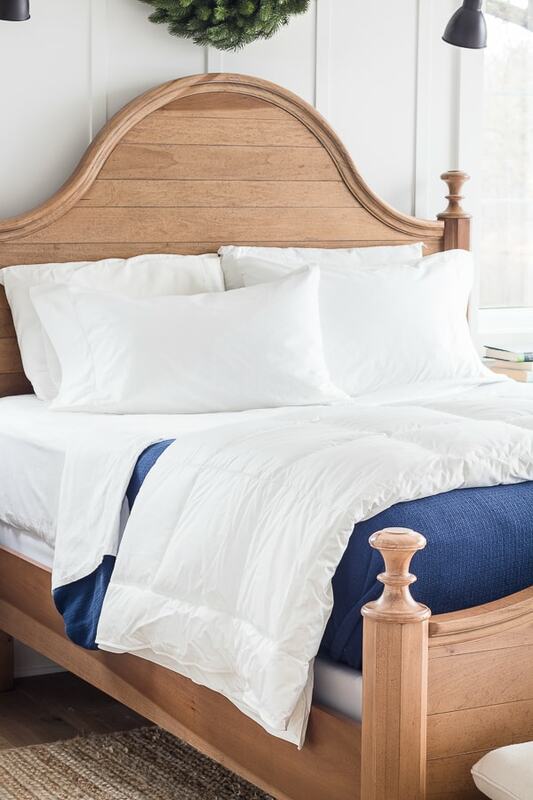 Their Classic Solid 100% Cotton Sateen Sheet Set come in great colors and gives you the crisp sheet feeling but with a softness I love. Even the Mr. noticed we got new sheets! 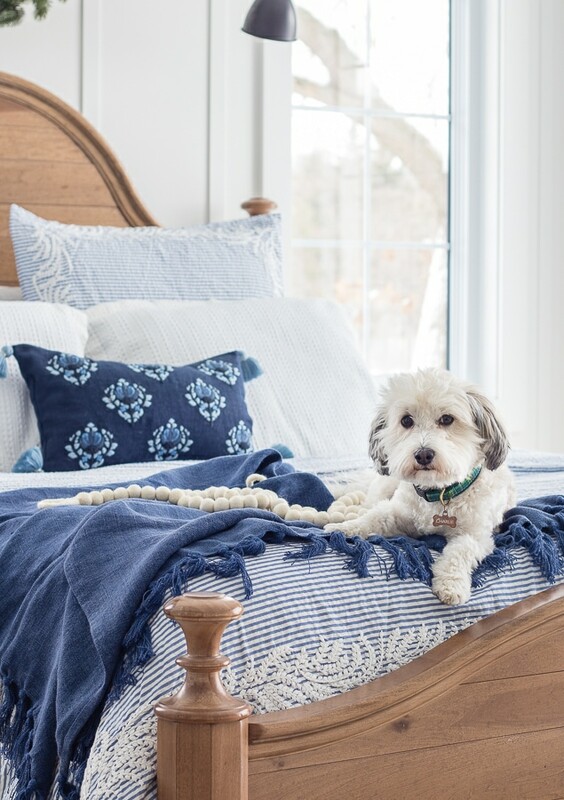 I’ve been on the hunt for the perfect not too heavy, not too lightweight blanket for our bed, and this Cotton Weave Blanket & Throw fits the bill. 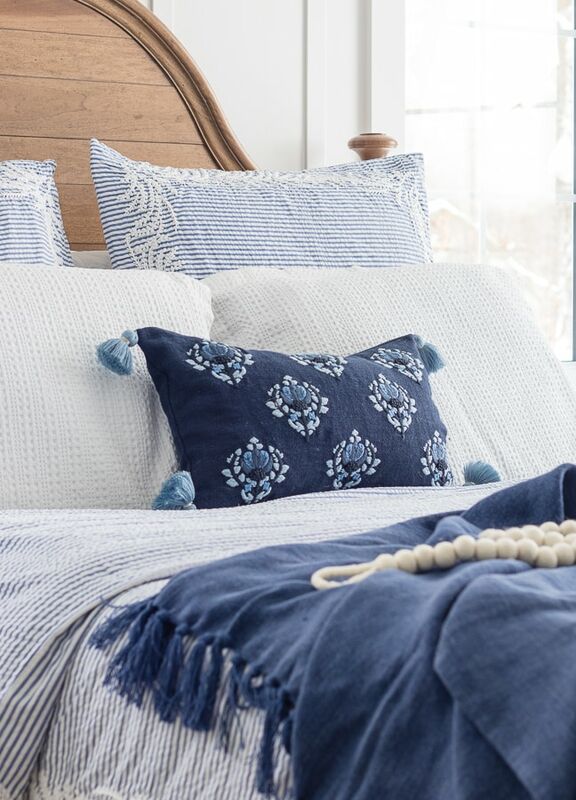 It comes in a ton of beautiful colors (I chose navy), and I like the option to leave it peaking out when I make the bed for an extra pop of color in our room. 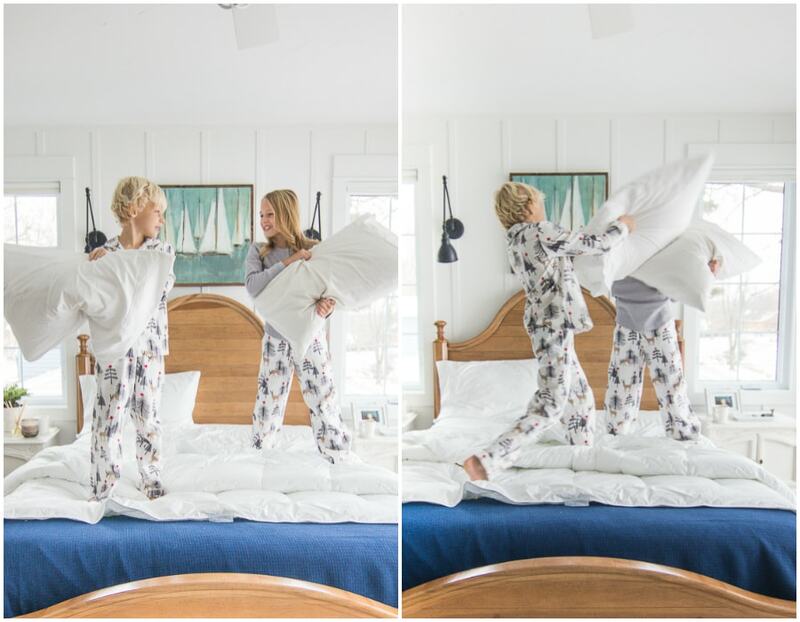 This is the perfect blanket to throw at the foot of a guest room too. 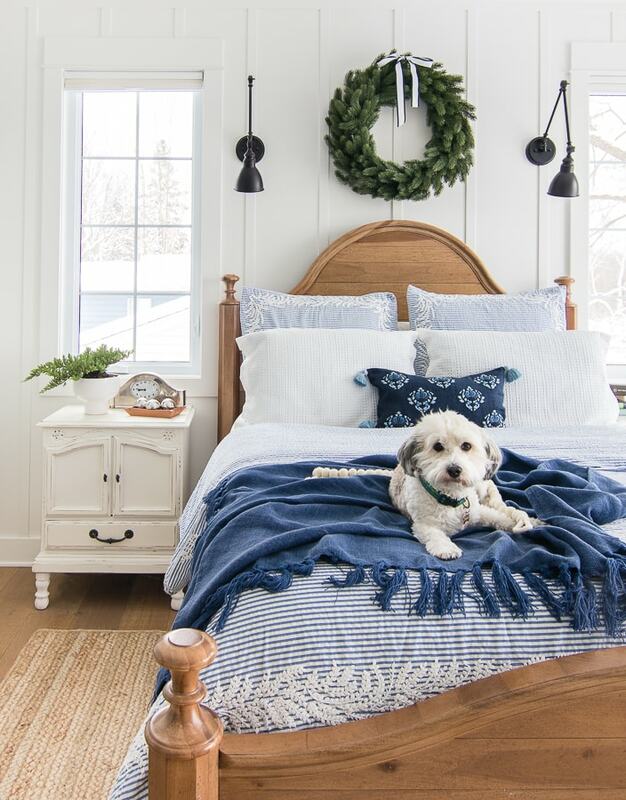 If you are having house guests stay over for Christmas, besides fresh bedding, it’s always nice to have the room smelling good too. 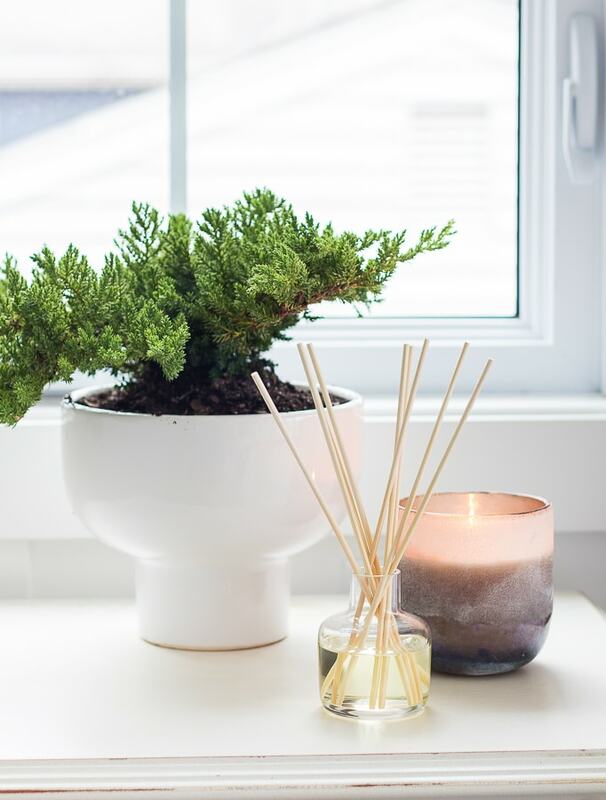 This Illume® Aromatic Diffuser – Winter White is perfect to leave bedside along with a candle like this Illume® Tonka Noir Mojave Glass Candle. These also make great hostess or neighbor gifts too! If you have a hard to buy person in you life, go for cozy! Everyone can always use a nice pair of slippers or a robe. 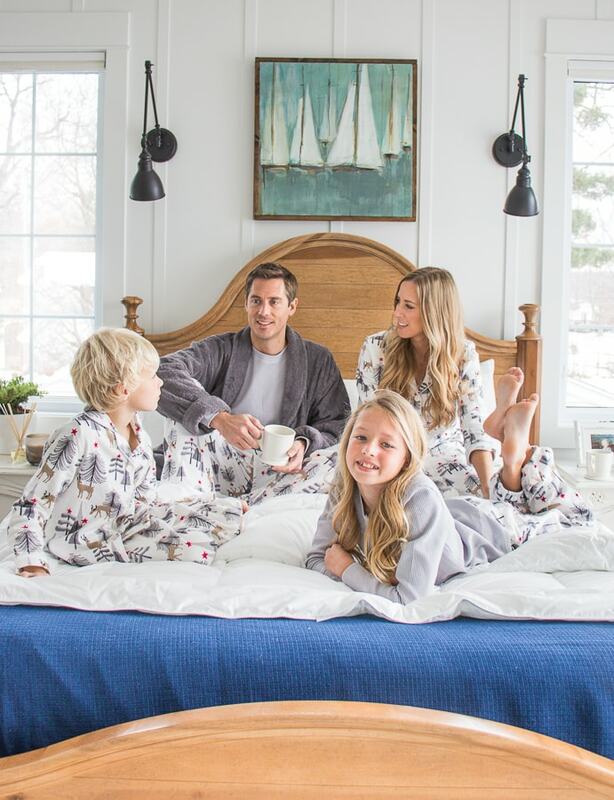 The Mr. loves this Company Cotton Robe for his early mornings. I ordered these cozy Women’s Slippers for myself, but a certain tiny fashionista has stolen them! 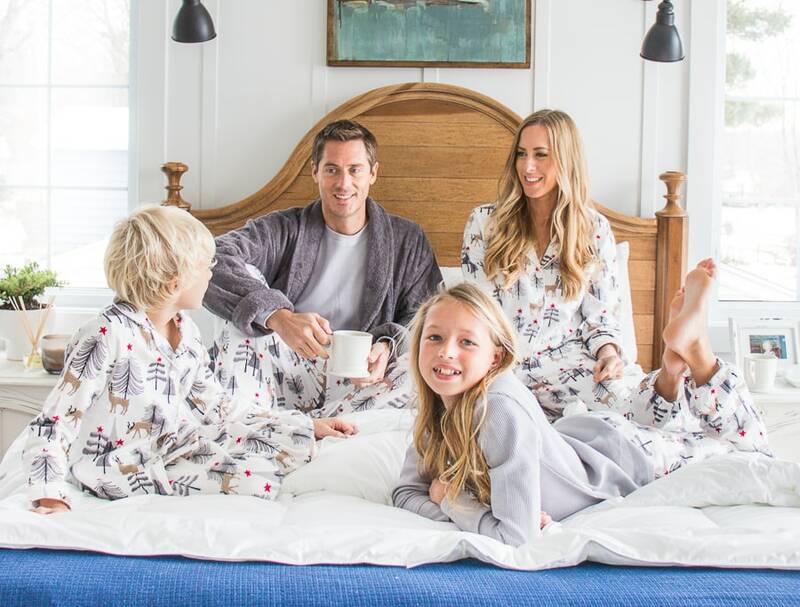 Ok and the ultimate gift for mom (meaning this mom) is matching jammies for the whole fam! What is it about twinning with my kiddos that makes my heart so happy? 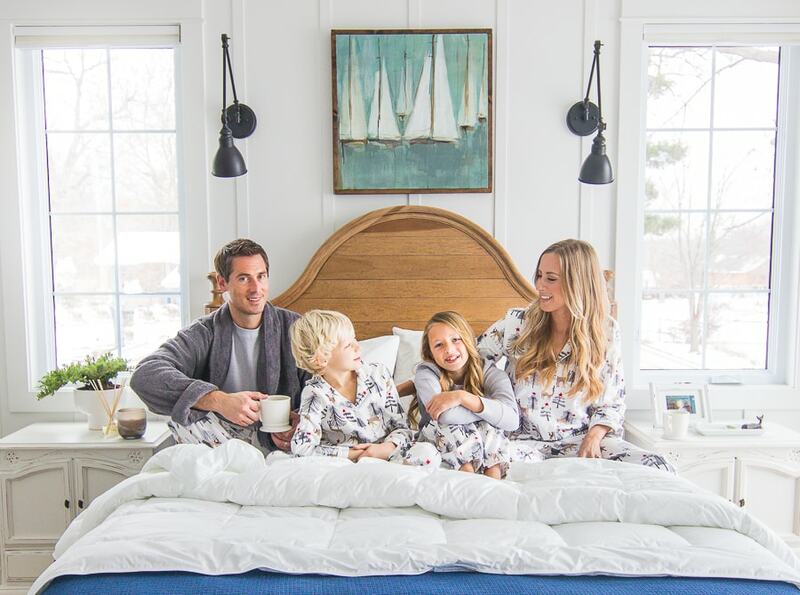 Even the Mr. agreed that The Company Store’s Classic matching pajamas are super comfortable, and I can’t wait to wake up in them on Christmas morning (preferably not until 8:00 am – ha, not likely!). 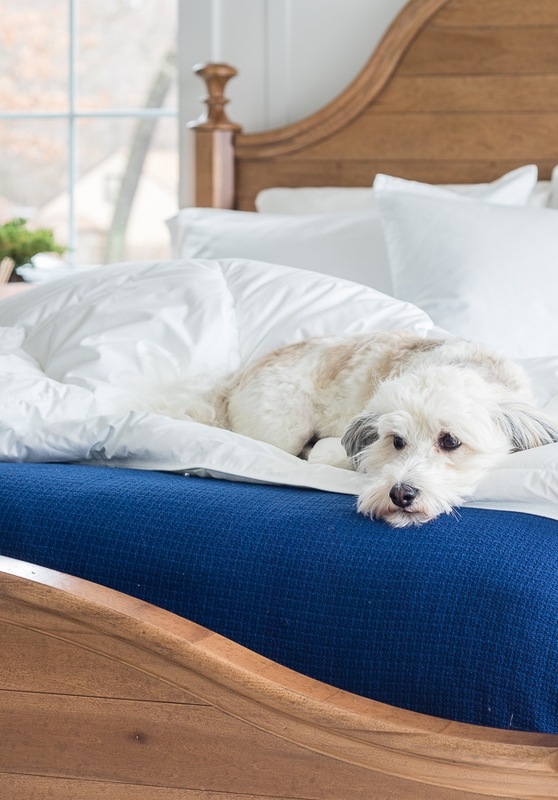 You can check out all the great bedding products that The Company Store has to offer for that last minute Christmas gift here or click any of the bold links above. My brain has been in full Christmas crazy mode for a while now, so in the spirit of crazy, I’ve got old fashioned random Friday Feels for you! First up, a few things that I got in my Winter FabFitFun box (I’m a FabFitFun partner) that have become part of my regular rotation. I love everything in the box which I shared on instagram, but these are my top 2 favorites. The Thrive highlight pencil. 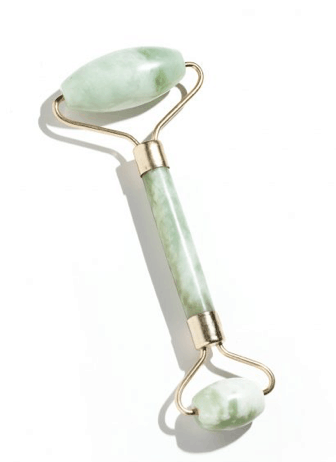 This little stick makes you look instantly more awake and it’s so easy to use. You just apply it in the corner of your eyes, under your brow or anywhere you need a little highlight. It’s not glittery or obnoxious, it’s just a subtle glow that makes you look like you had a good night’s sleep. This jade roller is amazing too. I have seen a lot of bloggers using these and I was pretty skeptical, but I really like it! I use it at night after I put my night serum and moisturizer on. It’s supposed to reduce puffiness and increase circulation. Bonus – it is super relaxing. My son has actually been coming into my room at night asking me to roll his sweet little face before bed because he finds it relaxing too. The price of the jade roller is actually more than the FabFitFun box, so if you are going to buy one, I recommend grabbing the box as it’s packed with fun goodies. You can use the code LILYPAD for $10 off your first box. Switching gears to clothes, I bought this sweater from American Eagle on Cyber Monday, and I have been wearing them nonstop. I say them because I grabbed it in two colors – grey and red, it’s my new fave! It’s under $30 right now so grab yourself one (or two) if you are looking for a cozy staple for your winter closet. The red is so festive for Christmas. Also, if you live up north like me and need really warm waterproof yet cute boots, you need these in your life. 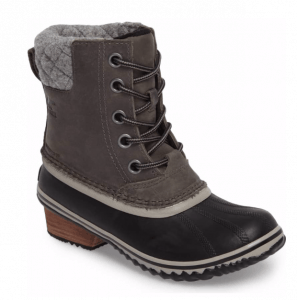 You know I have shared my love of Sorels in the past, so a 2nd pair was inevitable. I have had my current pair for 3 years, and they are still in perfect shape. I wanted to get a shorter pair (for when the snow is under a foot), and I recently picked up these cuties. I’m keeping my other ones (see them here) for playing outside with my kids, shoveling the sidewalk, etc. but these are perfect for running errands when it’s snowy. 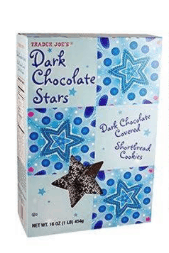 If you have a Trader Joes near you, run and buy the Dark Chocolate covered star cookies. My kids snuck them into the cart last week and I have been eating them non-stop…so maybe don’t buy them if you don’t want to eat the whole box. I think these are so cute to add to a desert platter for holiday entertaining. While you’re there, pick up this fig goat cheese log to add to your cheese plate – it’s so good and all the work is already done for you! Just add crackers and look fancy. 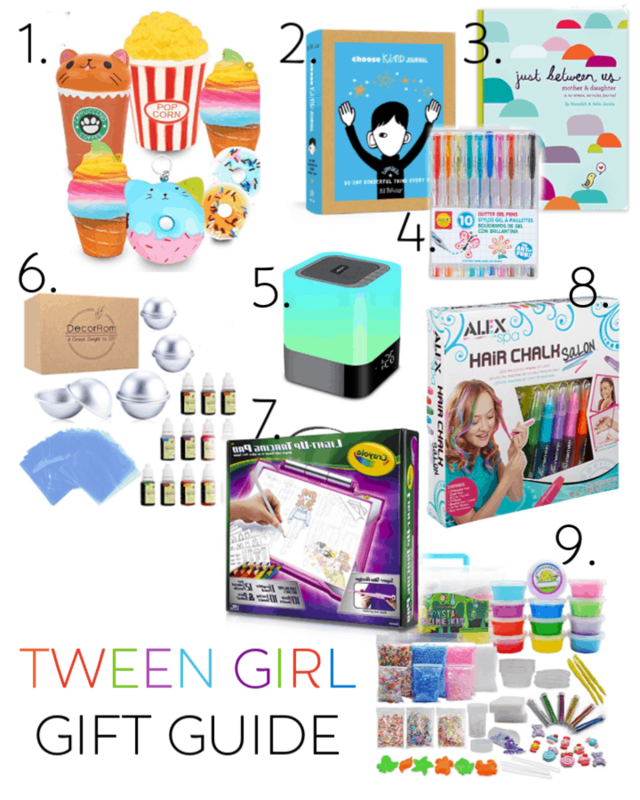 I mentioned in this post here how we teach our kids about giving (saving and responsible spending are in there too), and this year we are using the money they saved from their allowance all year to buy gifts from the World Vision Gift Catalog. So far they are arguing over whether to buy chickens or goats (in the true giving spirit those two! ), but I’m sure we will decide on something soon and they always feel great about being able to help others. 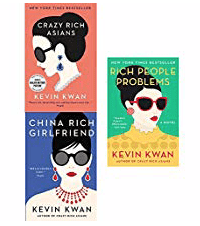 Ok last up, if you are traveling for Christmas and need a few fun reads to keep you company – I just read all 3 Crazy Rich Asian books by Kevin Kwan after I dragged the Mr. to the movie a few weeks ago (it was so fun and we both loved it!). They were great beach reads on our Costa Rica trip (which I plan on blogging about in the new year, for those of you who have been asking) if you are looking for something entertaining to read. Every year I get comments asking how I hang my garland, how I get it to look so full, and where I found it! 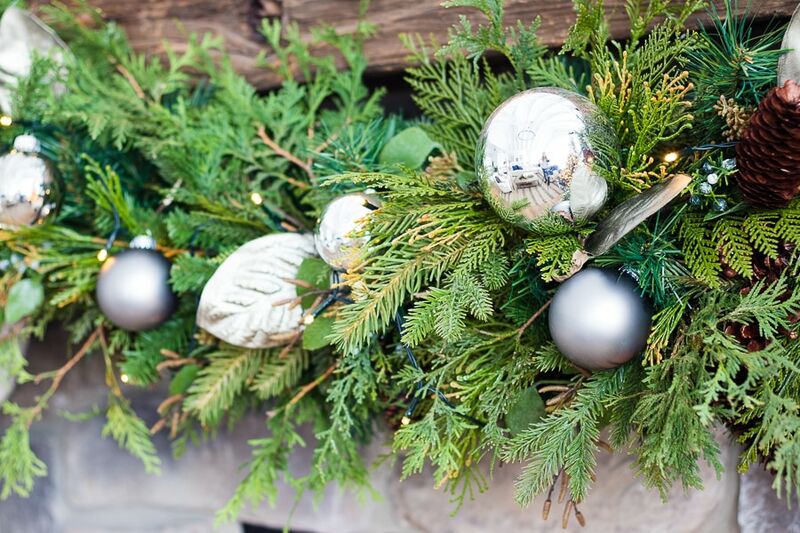 So, I thought I would share my top 5 tips for the perfect Christmas Garland today. 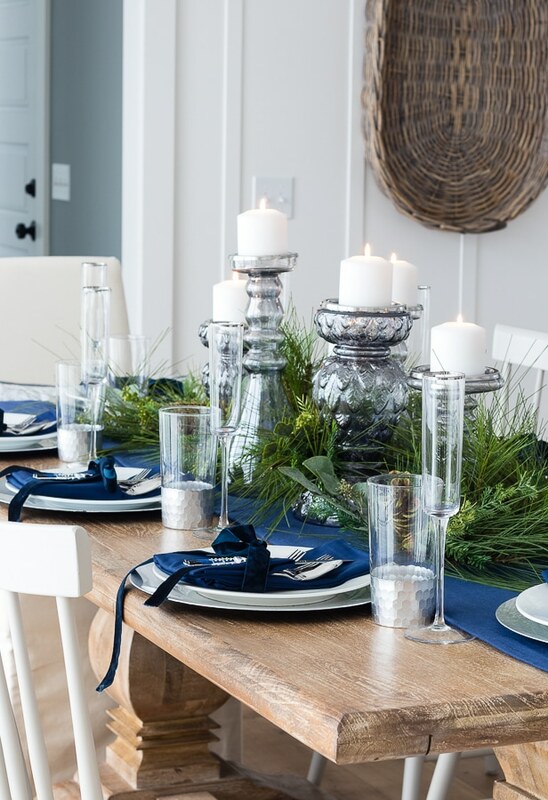 1st tip – Start with one of those cheap super bendy faux garlands. You know the ones we have all had around forever before they started making really quality faux garlands. I find the more realistic looking garlands aren’t as flexible or wired the same way as the cheap ones, so I like to start out with that kind to get the shape I want. Don’t worry we are going to cover it up! Here’s a shot of the back of my garland so you can see what I mean. You can also see the battery pack from the battery operated lights I wound throughout it. Tip 2 – Floral wire and nails. I use nails every year to hang my garland because I like my garland nice and full. This thing gets heavy and those command strips wouldn’t be up for the task. 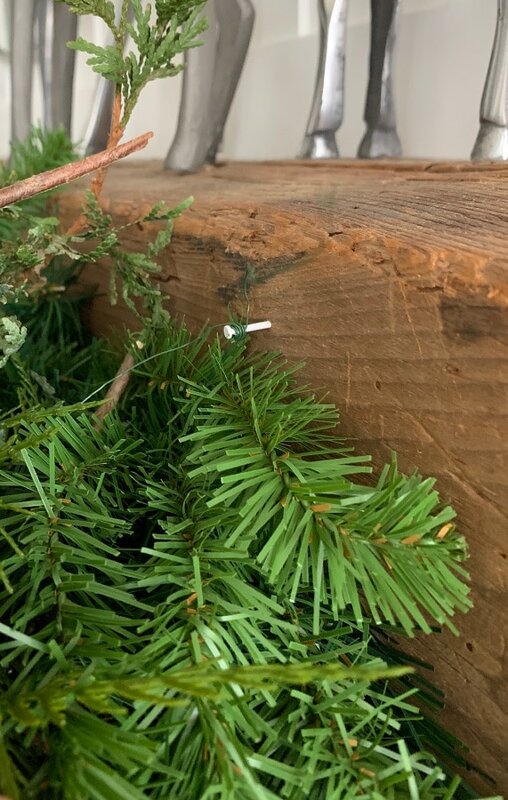 I have a rustic mantel so it’s not a big deal to add more nail holes to my beam, but I actually used these same tiny white nails at our old house. We had a white mantel with moulding and I very carefully tapped these nails right under the top piece of moulding and left them there all year round. You never even saw them the rest of the year. Once you have your nails secure, loop the floral wire around the garland, and then wrap it around the nails several times. 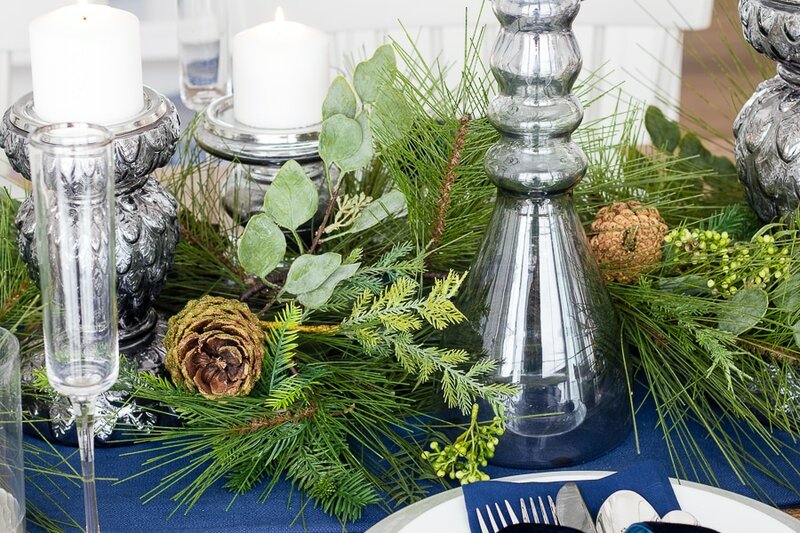 Tip 3 – Add faux or fresh greens. For the past few years, I have added fresh greens that I’ve clipped from my backyard to make the garland look realistic. 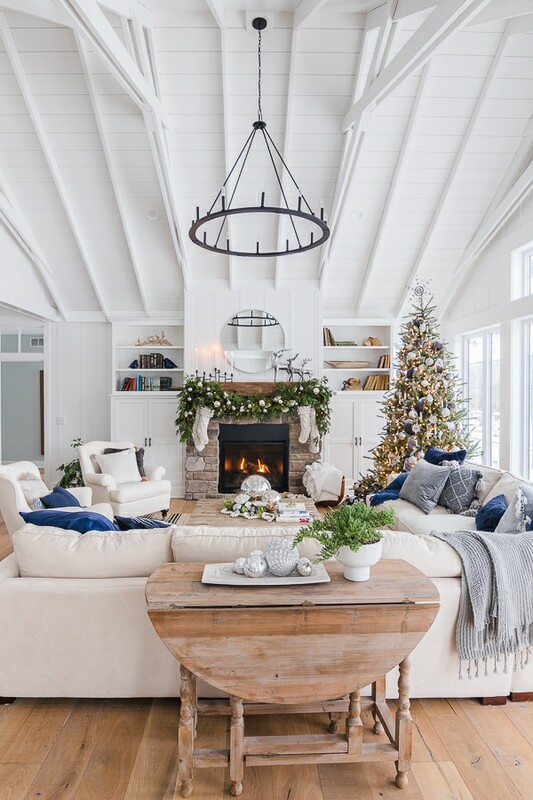 This year I decided to try using several faux garlands to get the same look so I didn’t have to deal with the dry pine needles all over my house. 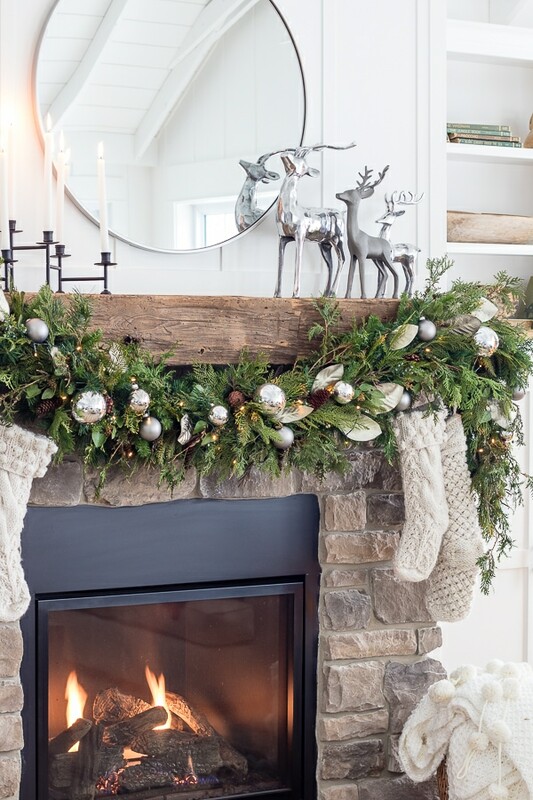 So yes, this entire garland is fake and mess free! If you do use real greens, mist with a spray bottle occasionally to prolong their life. 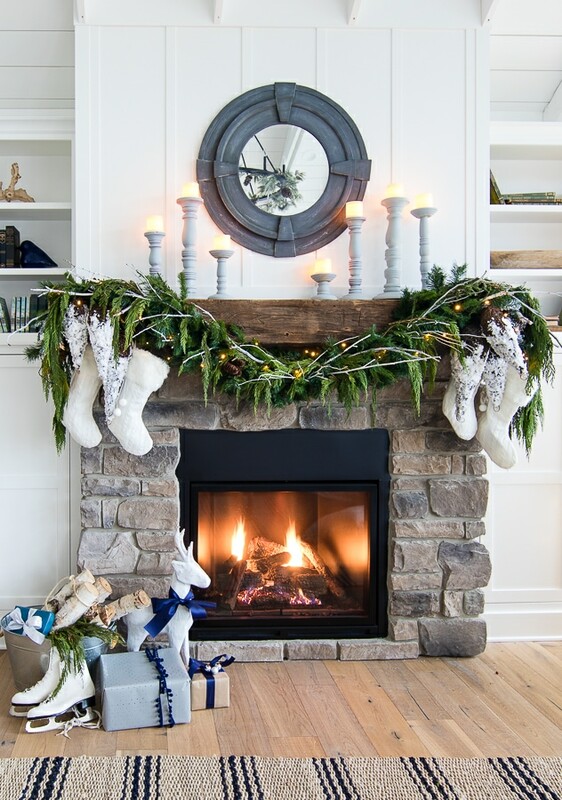 Tip 4 – Cut your faux garland up if need be. This garland has 3 different garlands wrapped together. They are 6 ft, but my mantel is a little over 6 ft long. To stretch my garlands further so I could get that swag look, I cut them into several pieces so I could stick them here and there. Then I could get the shape and look I wanted vs. trying to wind them all together. You can always wire them back together again if you want to use them differently the next year. All the gold leaves you see were snipped off of a garland and added in individually. 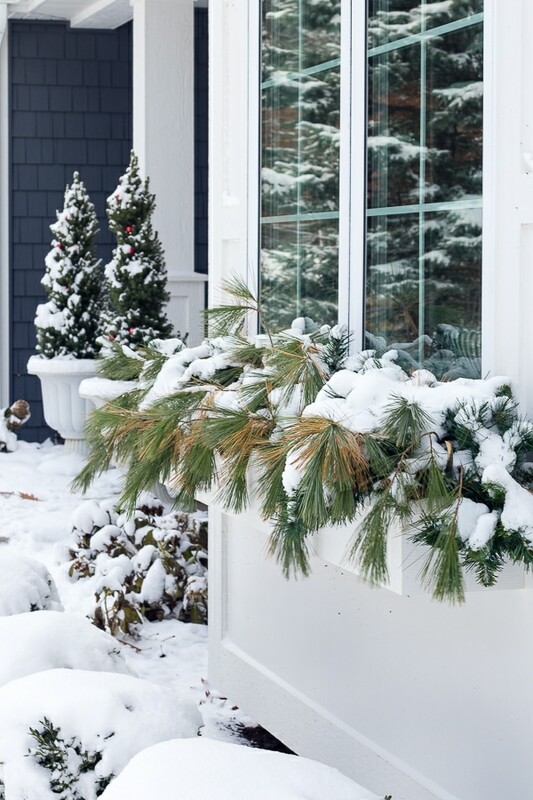 Tip 5 – Finish it off by wiring in ornaments, floral picks, sticks from the yard, anything you want to get the look you are after. I added some silver and grey ornaments to my garland this year. Oh and those stockings? I looped those right on over one of the bendy cheap branches of the first garland. 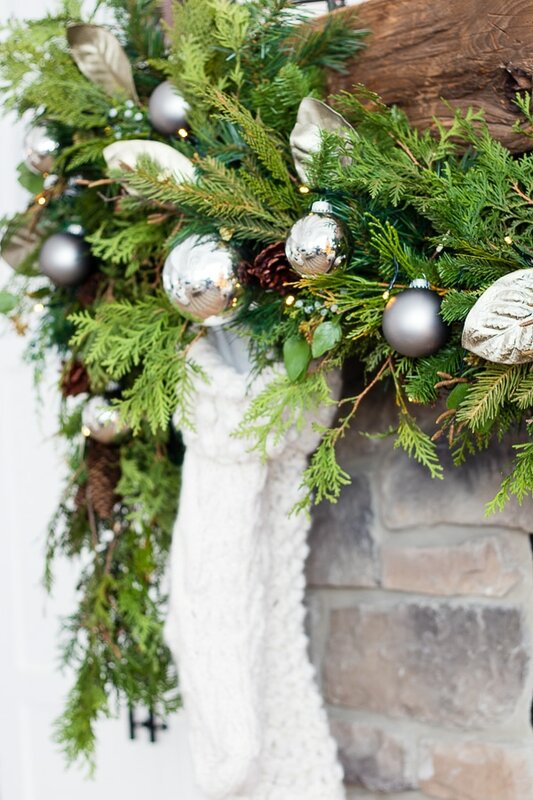 I hope you all found my top 5 tips for the perfect Christmas garland helpful. Also, check out some of my mantels over the years below! I linked all of the garlands I used in my source list, so just click on the bold work to take you to the item! Wow, hard to believe this is the 6th year that I have been doing these Christmas tours! 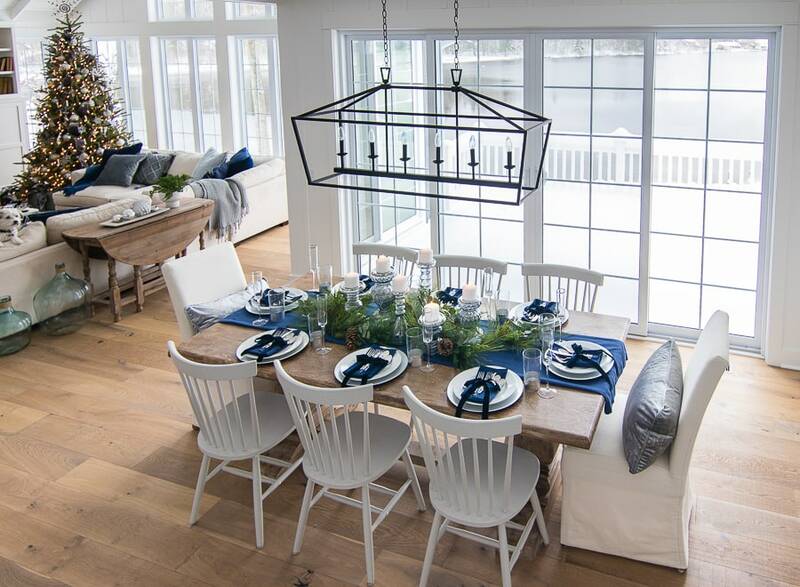 I’m teaming up with some of my blogger friends to share our homes all decked out, so if you are coming over from Jennifer at Decor Gold Designs – welcome! 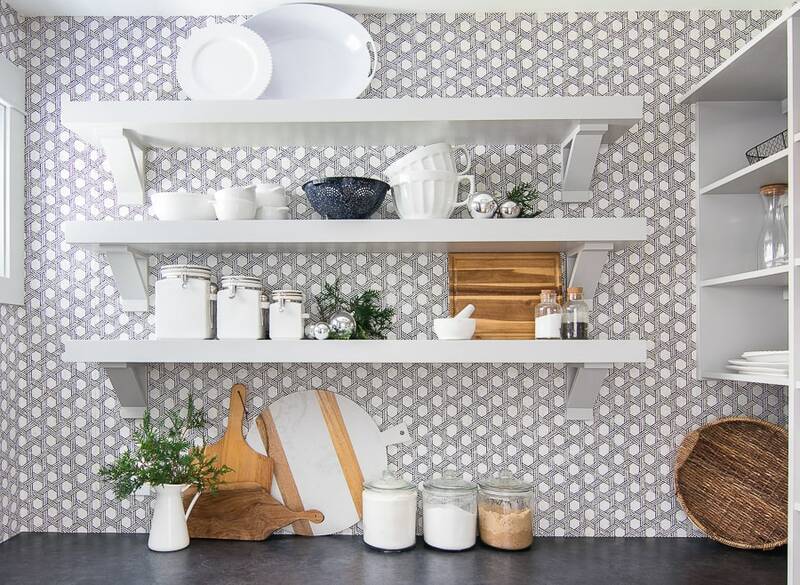 If you are just starting out here, be sure to check out her gorgeous home tour here. I have done a lot of fun snowy themes in the past, and this year, I decided to go more classic and simple. I kept my colors to mainly greys and silvers, fresh greens (well fresh looking), and of course a few touches of blue. 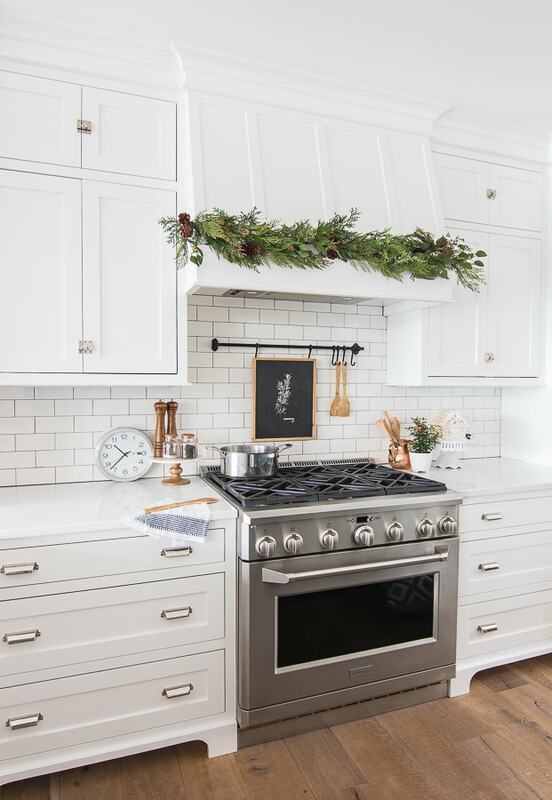 I started things off in the kitchen with a simple garland. 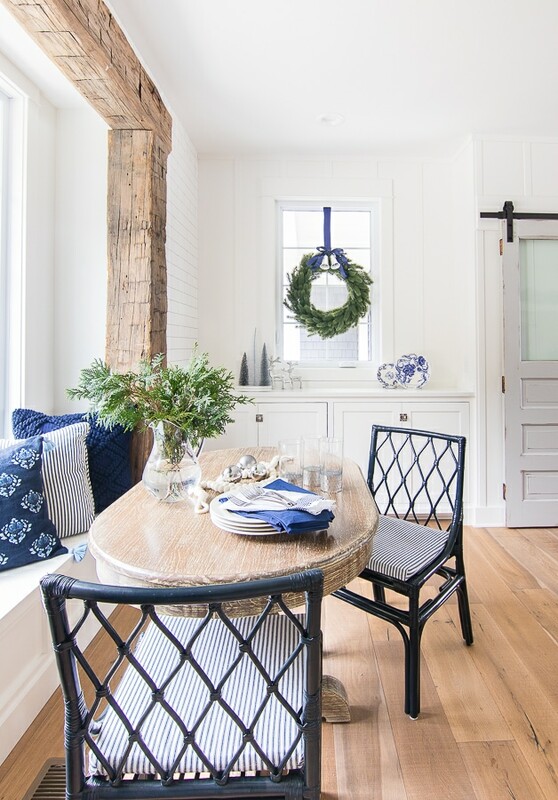 A few touches of blue in the breakfast nook. My pantry is decked out with fresh sprigs of green and silver ornaments. Then onto my dining area all set for hosting my family Christmas eve. My family room is the home for my new gorgeous realistic looking tree. 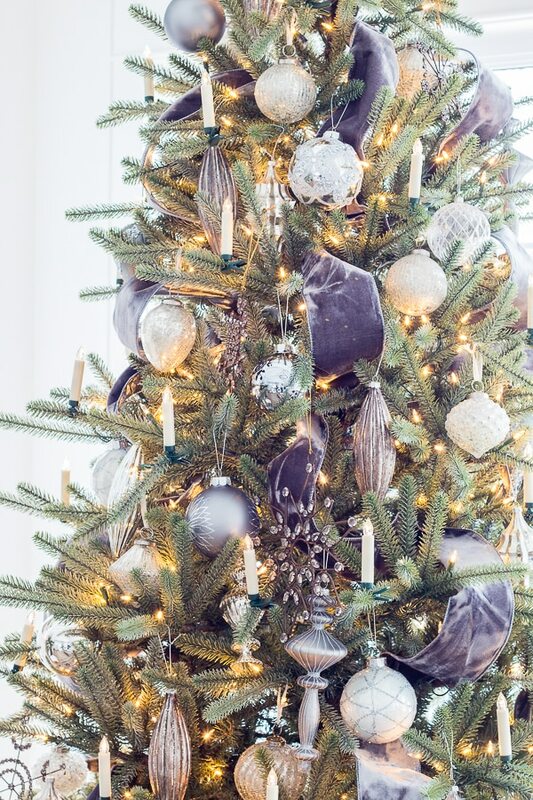 The classic mercury glass ornaments and velvet ribbon set the tone for our whole home this year. I added cozy knit, velvet and faux fur pillows. I kept my same candle sticks from my fall tour on the mantel and added these cozy knit stockings. 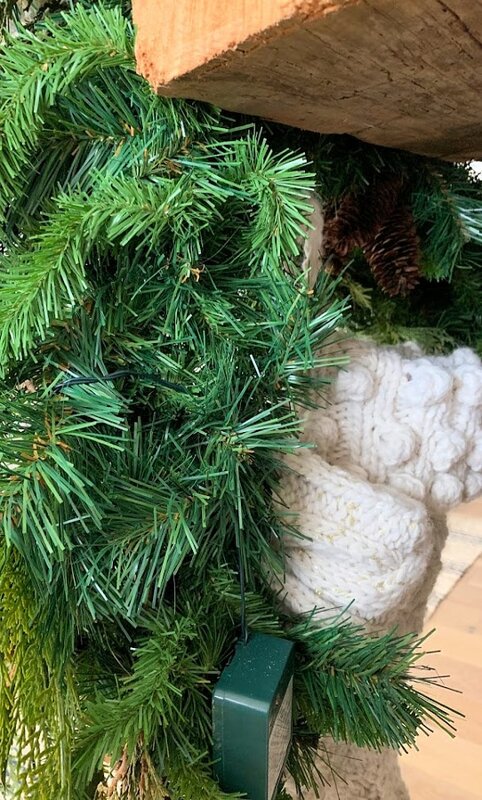 I’ll be blogging more about this garland next week, but I also share some helpful garland tips on my saved Instagram stories if you are looking for some help! 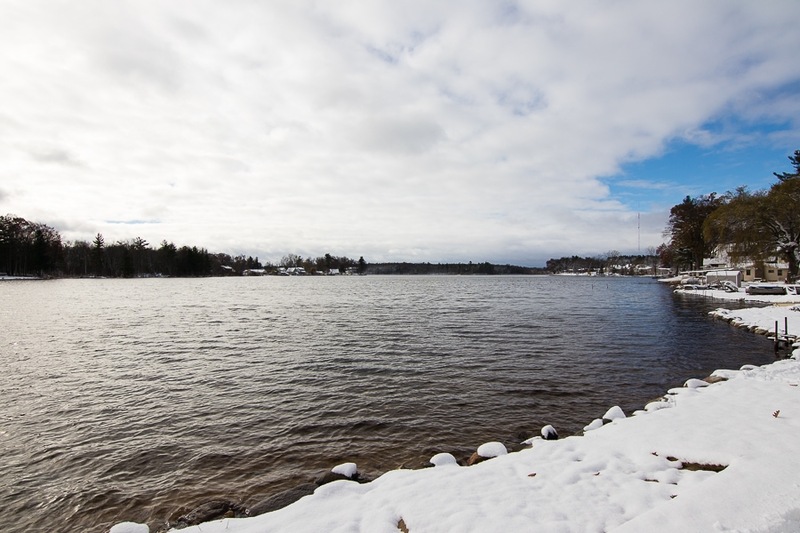 It’s always my favorite part of winter when there is snow on the ground, but the lake hasn’t frozen yet. 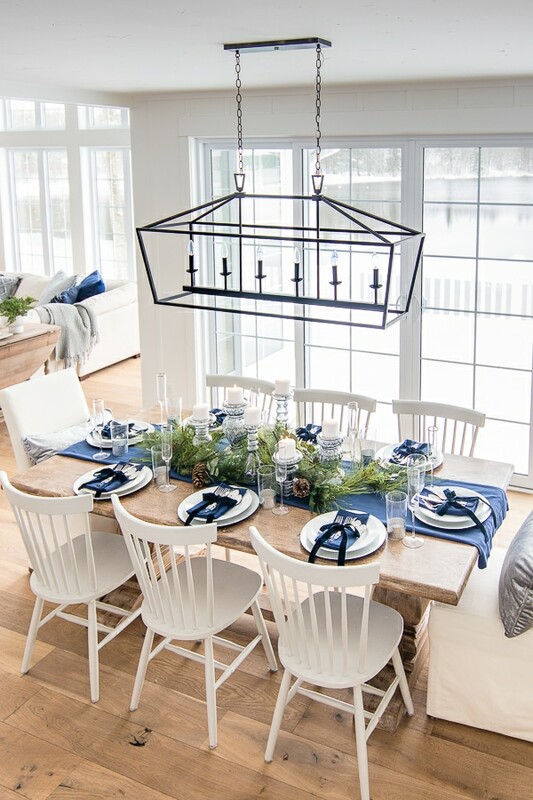 It’s hard to see in these photos, because it was snowing so hard outside when I shot this, but the blue water against the white snow is so pretty. 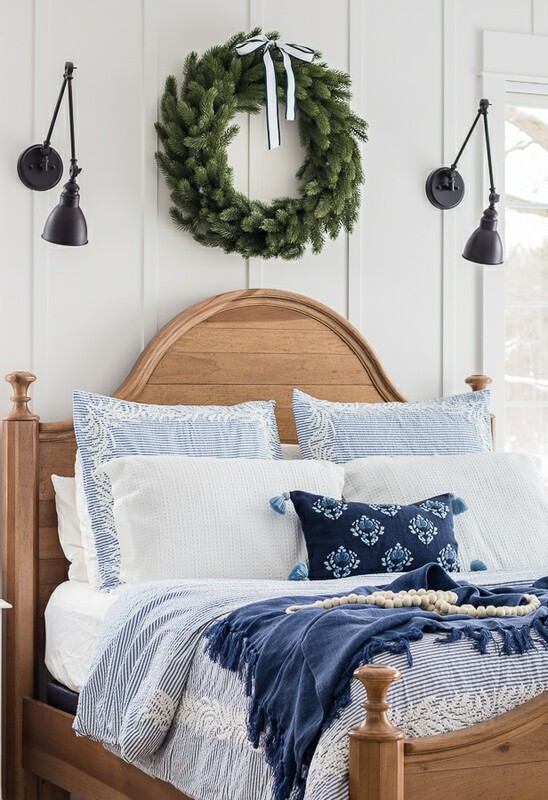 Our bedroom got a simple wreath and some cozy new bedding. 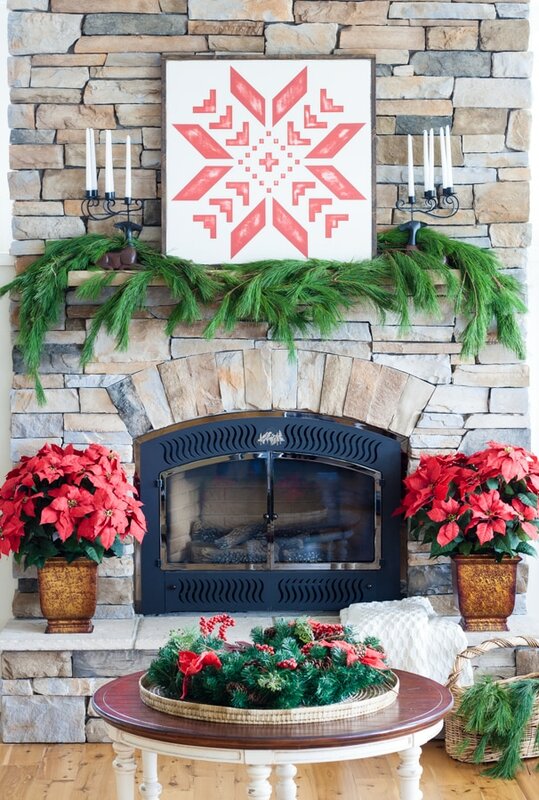 No matter what colors I decorate with on the inside, the outside always gets a pop of red! We need something to cheer up the snowy exterior. 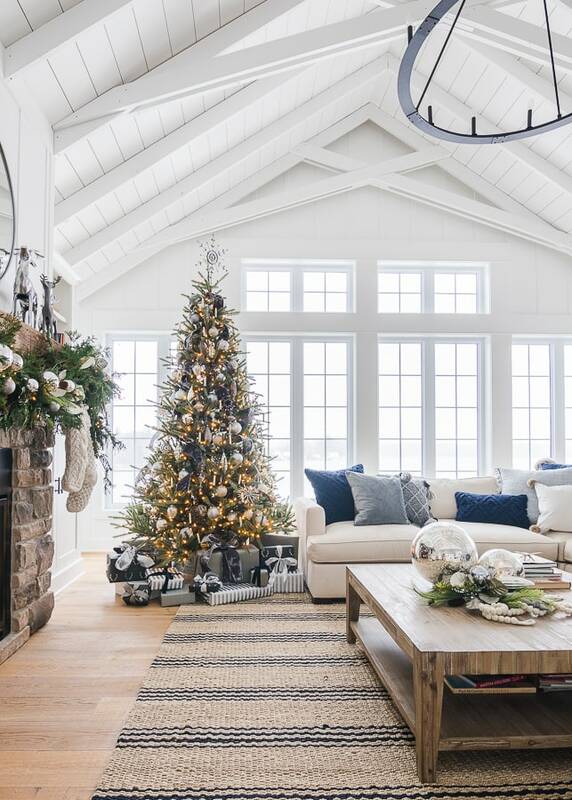 That’s it this year – just a few festive touches to make it cozy all season long! 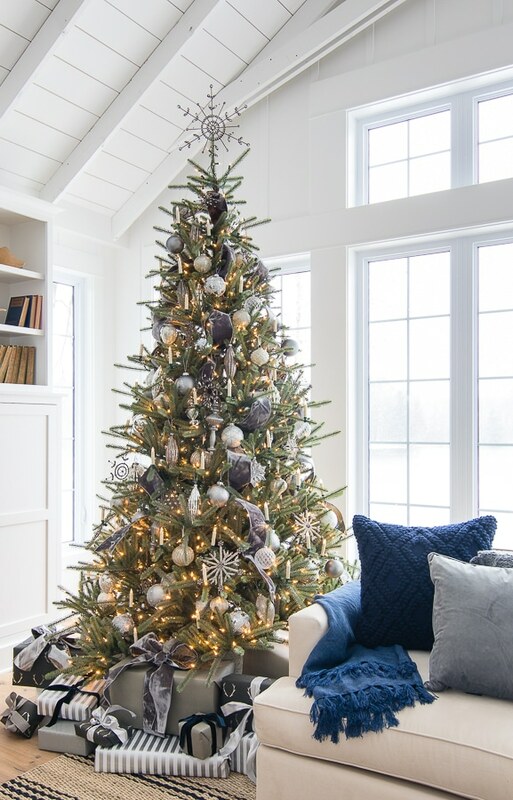 The next stop on the tour is Randi from Randi Garret Designs – she has the most beautiful Christmas tree, you can tour her beautiful home here! 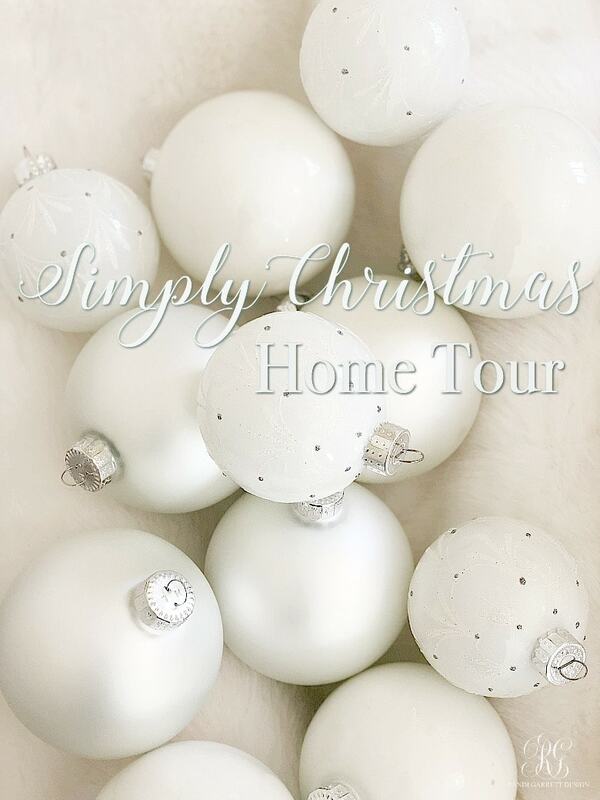 Be sure to check out all of the other fab bloggers participating in the tour! You can see all the other bloggers below as well! What are you all serving for Christmas? I mentioned earlier this week that I’m hosting both sides of the family. The Mr.’s family on the 23rd and my family on the 24th. 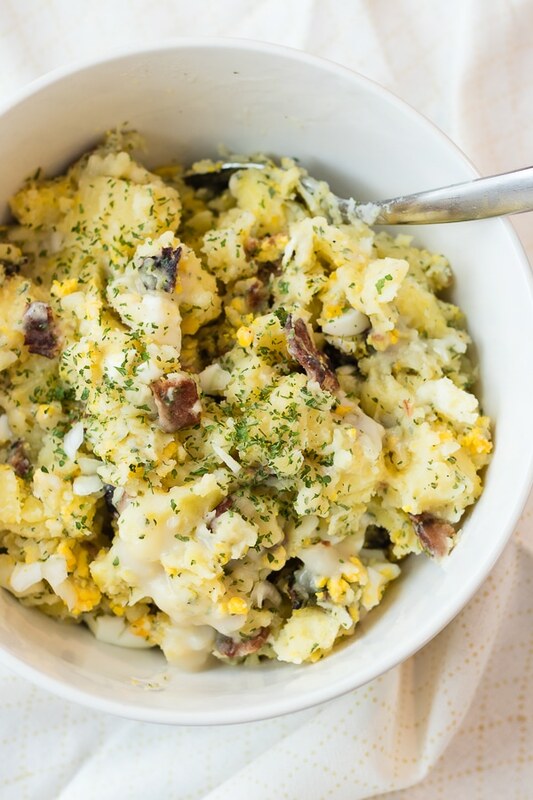 I thought it would be fun to share the menus with you along with my Grandma’s Hot German Potato Salad Recipe. First up on the 23rd, the Mr. has decided to take over the protein for me and is planning to roast a beef tenderloin. He recently did an Iron Chef style cooking challenge as a team building activity at work and learned how to make a demi-glace sauce (he tells me that his cuisine reigned supreme in kitchen stadium that day – easy Bobby Flay). On a side note, does anyone remember the original Japanese Iron Chef from 15 or 20 years ago? Wow, the Mr. and I loved watching late night Iron Chef episodes with goofy secret ingredients, the eccentric chairman and poorly dubbed voiceover. Ah-lay Cuisine! Anyway, I’m handing the reigns over to the Mr. for Christmas party number one, and if it’s good (mainly if he can remember how to make it, ha) I’ll post the recipe soon! I’m trying this cheesy cauliflower gratin dish that Michael from Inspired by Charm shared on his blog. It looks amazing! I also plan on making twice baked potatoes because I can make these a day ahead and just pop them in the oven. I make a million different variations of them, but here is a recipe I’ve made in the past. I’ll round things out with roasted asparagus and this apple pecan blue cheese salad from the Pioneer Woman. Christmas eve is a bit trickier. My brother’s kids have a few different food allergies (eggs, peanuts, and gluten) so I have to be a little more thoughtful with this menu. We usually do a ham on Christmas, and thankfully Honey Baked Ham is gluten free and is simple to heat and serve, so that’s one thing easy to knock off my list. Also, let me just say that I realize this is not the most attractive looking recipe (especially not attractive when Charlie hops on the table and helps himself to the bacon that I ever so carefully sprinkled on the top! ), but it is delicious! 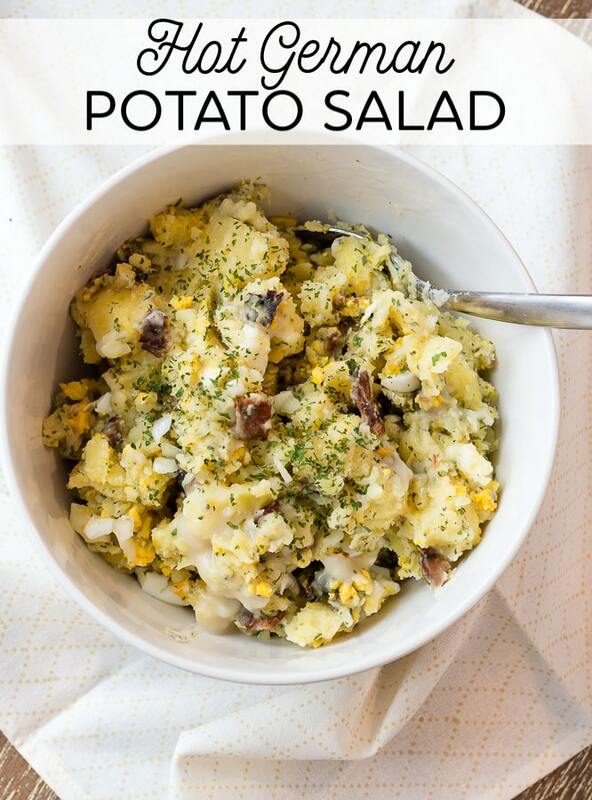 Think potatoes, bacon and hardboiled eggs with a tangy hot bacon dressing. 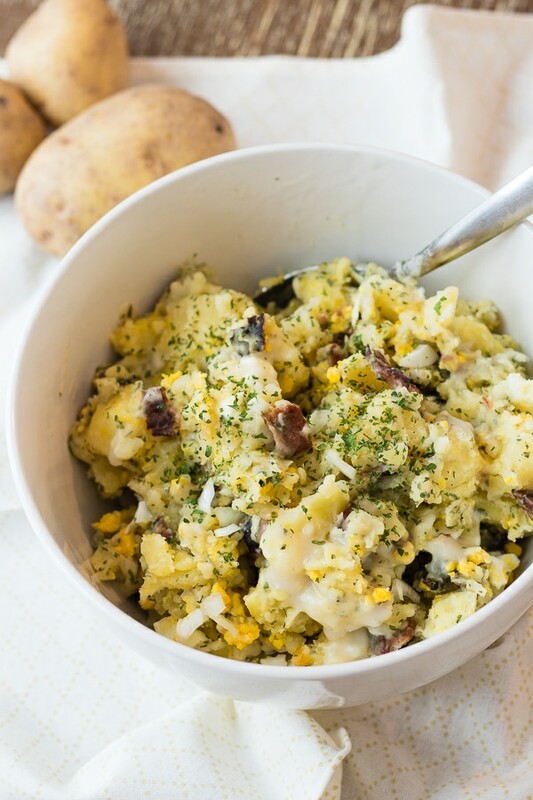 Gently toss boiled potatoes, parsley, onion, hard boiled eggs, and bacon together. In a saute pan whisk reserved bacon fat with flour until smooth. Slowly whisk vinegar and water in. Pour over potato mixture. You may only use ⅔ of the sauce or use it all depending on how saucy you like your potato salad. If I'm making this ahead of time and reheating, I reserve some of the sauce to add after warming. It tends to absorb all the sauce as it reheats and can become dry. Spiced apples are always a good kid friendly accompaniment to this meal. I just throw sliced apples, cinnamon and a bit of sugar in a crockpot and let them go. Easy and allergy friendly. I’ll saute some green beans in butter and buy some gluten free and regular rolls to serve along side. An egg free, nut free, gluten free dessert can be a tricky one, so we alway opt for peppermint ice cream with homemade hot fudge on top! Oh and not to be forgotten, for our own little family I make homemade cinnamon rolls for Christmas morning breakfast every year, it’s my favorite tradition! Happy Weekend! On the Mr.’s side, all the kids are all old enough to relegate them to the kids table in the breakfast nook. Since the roll throwing will be kept to a minimum (I think, you never know with the Mr.), I can make the adult table really beautiful and not worry about it all crashing down. I knew I wanted a little blue in my table (I know, shocking), so I started with this KAF Home Buffet Tablecloth in Navy. I like the texture of seeing my wood table, so I folded it in quarters to create a runner for this look. 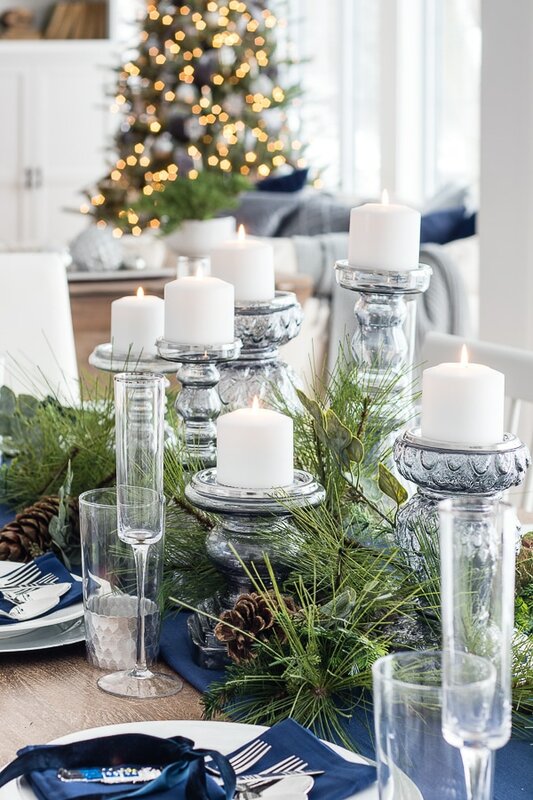 These gorgeous DecMode glass candle holders (I ordered 3 separate pairs and you can find them here, here, and here) were next on the table. I love the timeless feel and they aren’t too high so so they don’t block conversation. In keeping with my metallic and silver theme, I added these Jay Silver Charger Plates under my basic white plates. I finally have a full matching set of flatwear with this gorgeous 5 pieceset by Fortezo Arezzo. I love the modern handle, and they are really nice and heavy. 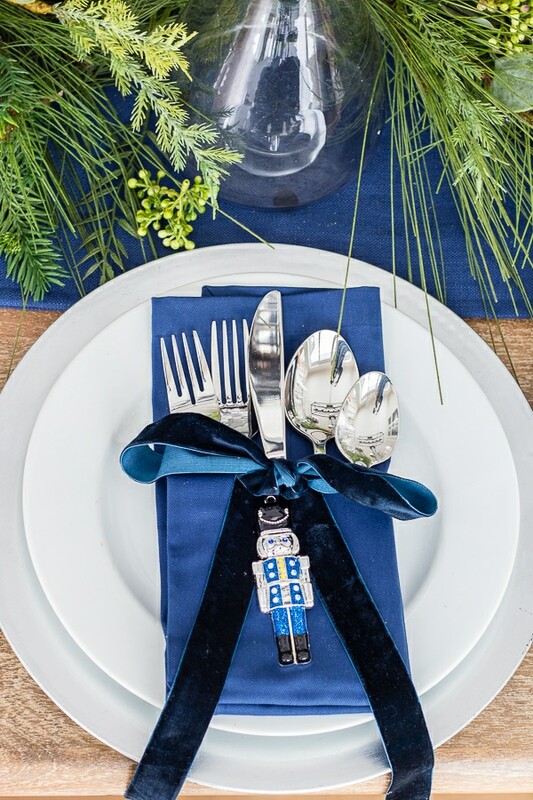 Next up matching KAF Navy Napkins, a little velvet ribbon, and these cute little Northlight Nutcracker Ornaments for a touch of fun to the table. Onto the glassware! 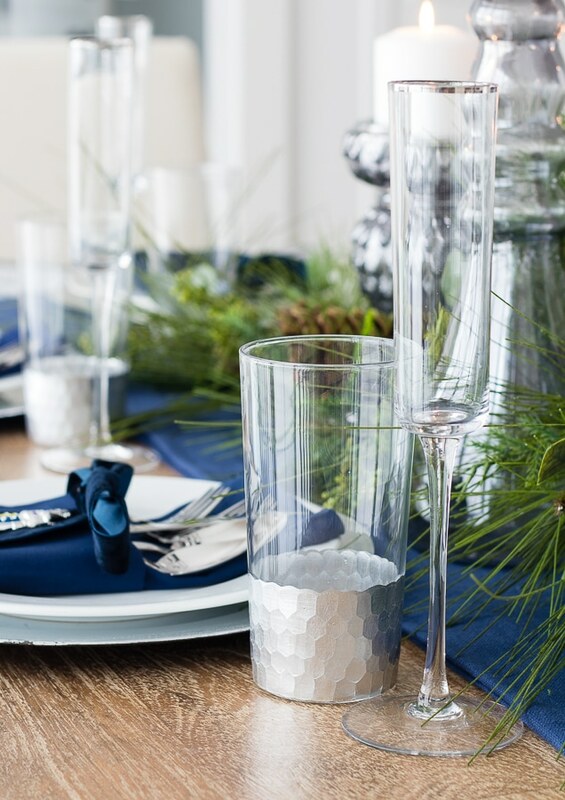 If any occasion calls for champagne, it’s Christmas and these Zodax Champagne Flutes are perfect on my table. The silver bottom of these Zodiac Highball Glasses adds another special touch to the table. Hayneedle has really gorgeous garland options and I used a mix of two on my table. 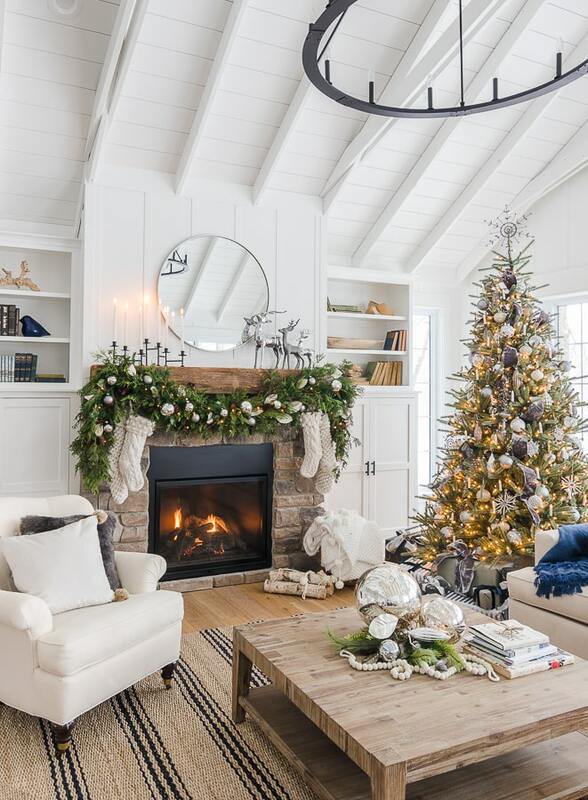 The Sullivans 6 ft Sugar Pine Wild Woods Garland and the Sullivans 6 ft Cedar Juniper and Eucalyptus Garland. In the past, I have always combined faux and real garlands to get a more realistic look, but these garlands are so good that I didn’t need to add in any real greens. I did combine several of the faux garlands together for a nice mix though. Our dining area overlooks our fireplace mantel, so I added the same garland along with a Pewter Magnolia Leaf Garland as well. 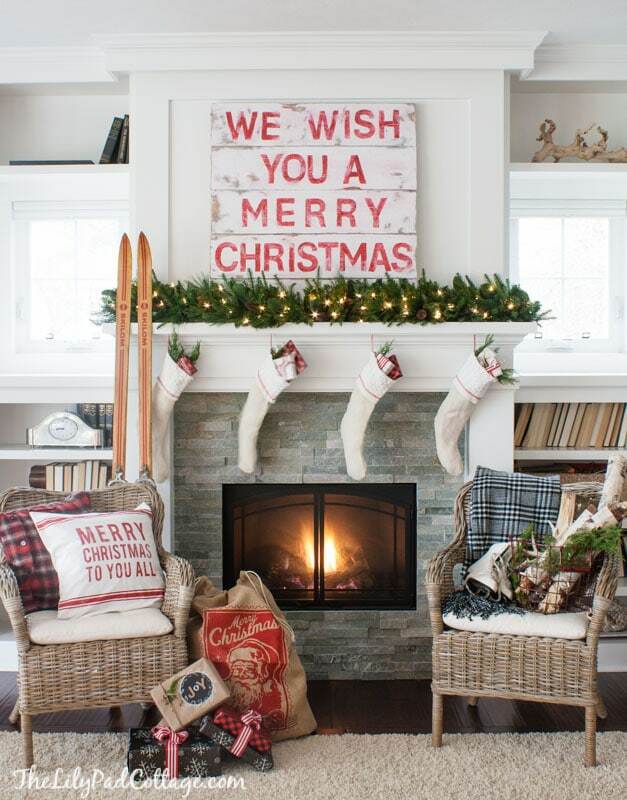 I’ll be sharing more of my mantel in my full Christmas tour coming soon! 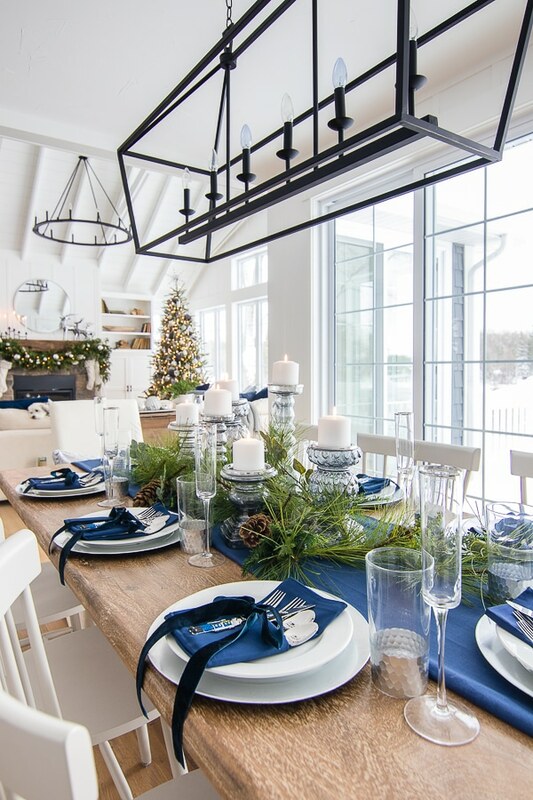 These beautiful candles are the perfect centerpiece for my table all season long as it looks beautiful even when it’s not set for guests. I’ve almost finalized my menus for each party and maybe I’ll share that on Friday if you all are interested? It was fun to partner with Hayneedle on their “I wish” campaign this year. 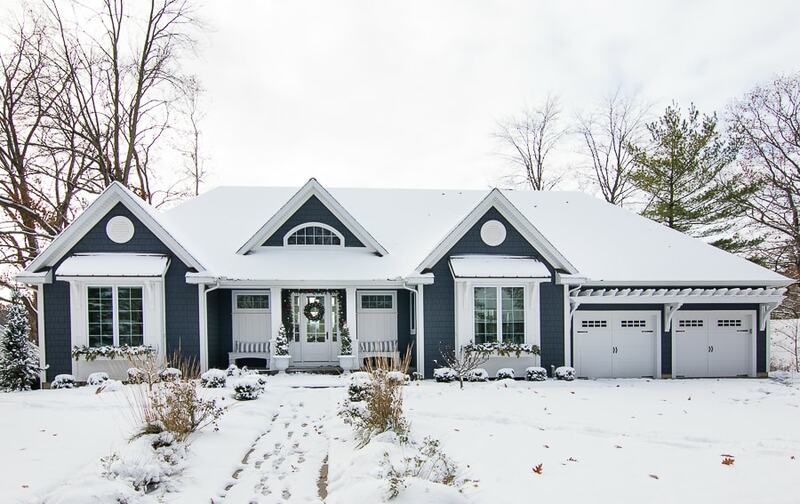 They want to help you achieve the feeling you want for your home this season. 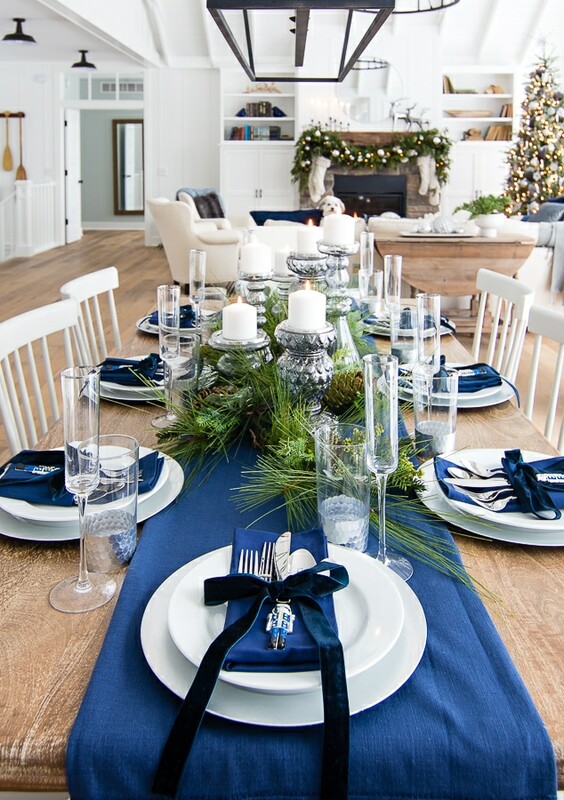 I wish for fun memories and laughter this Christmas as we gather around our table. 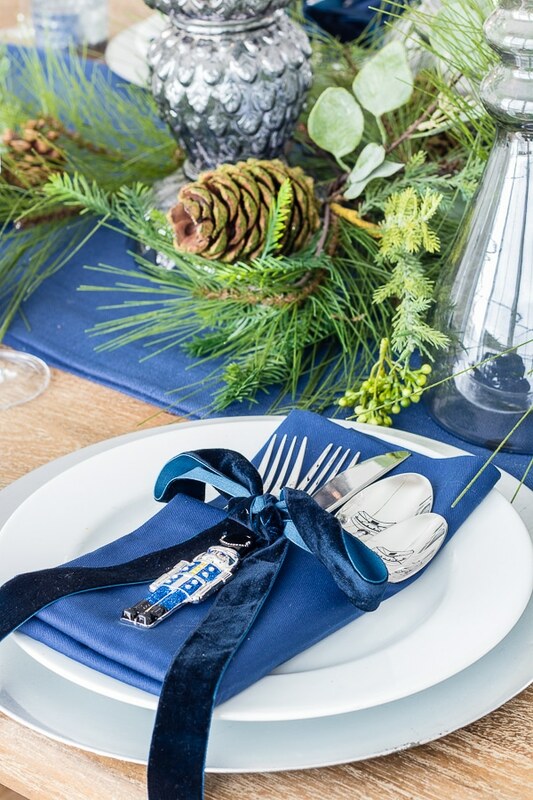 Be sure to check out all of their Holiday products here!ilver and Navy Christmas Table Setting. 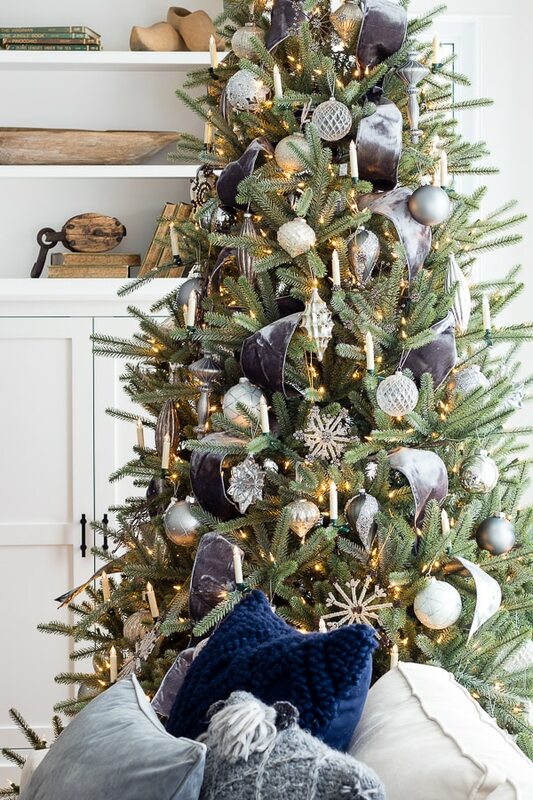 I’ve been sharing a few sneak peeks on Instagram, but the day has finally come to share all the details of my Christmas tree! After several years of flocked snowy themed trees, I was ready for a more classic looking realistic tree. 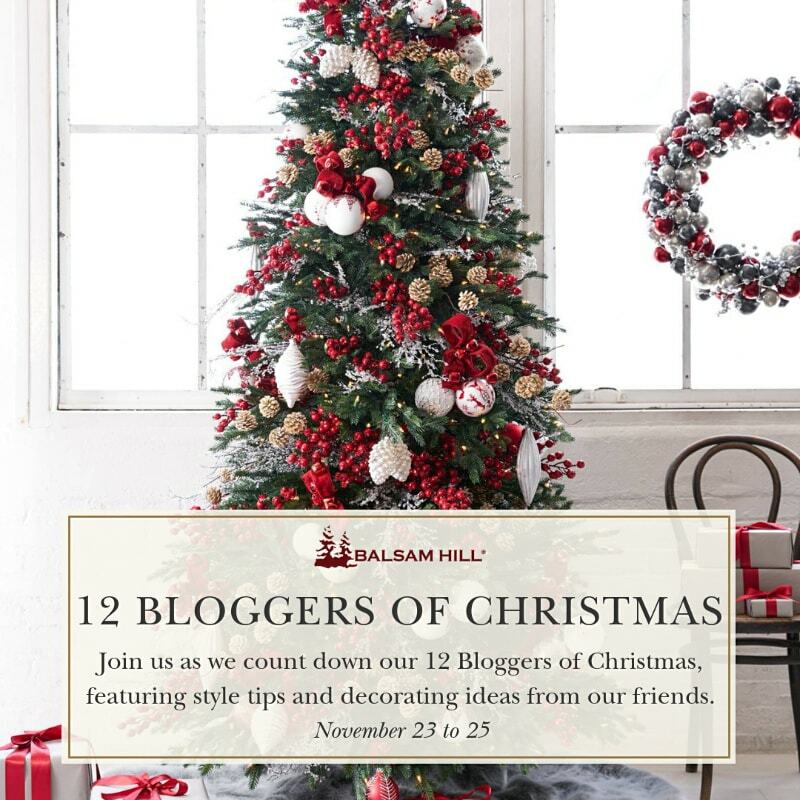 When Balsam Hill invited me to participate with their Balsam Hill 12 Bloggers of Christmas campaign I was thrilled! 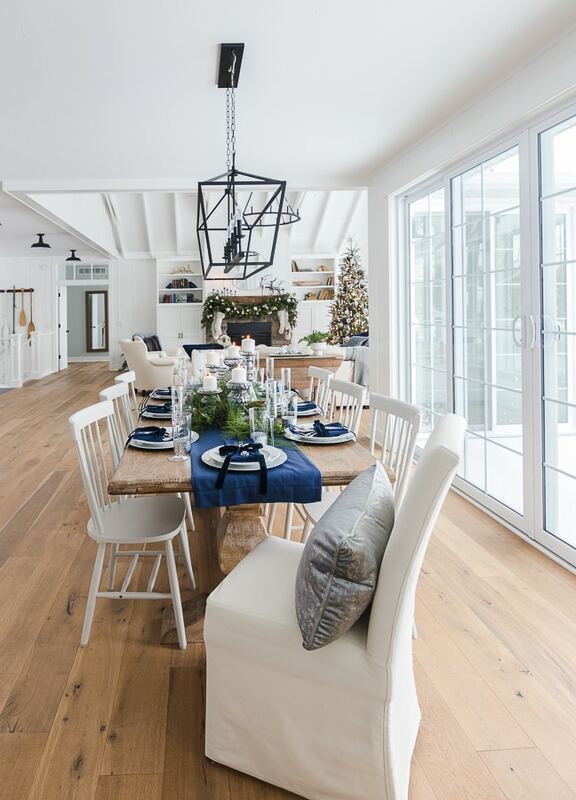 I’m excited to be joining 11 other bloggers who are sharing their Christmas style. 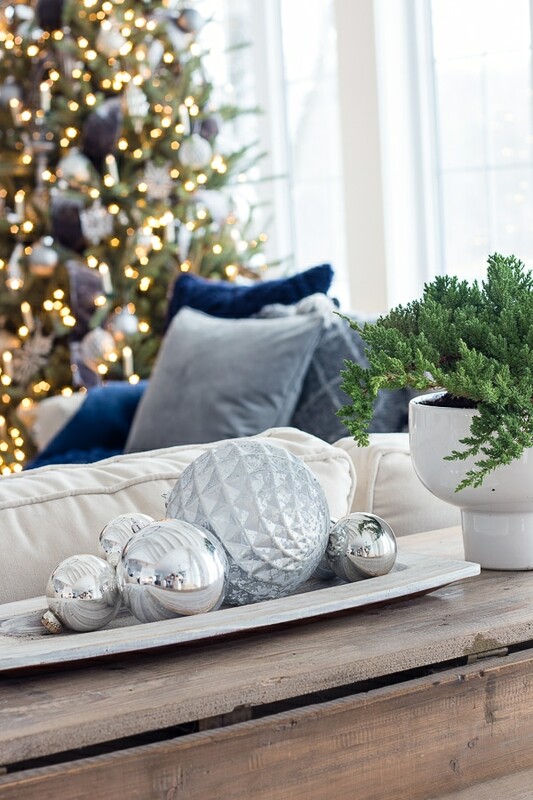 With all the white in our new home, I was craving the fresh green look of a real tree. It’s especially white in all of these photos, because I shot this in the middle of a snowstorm – it was very cozy. 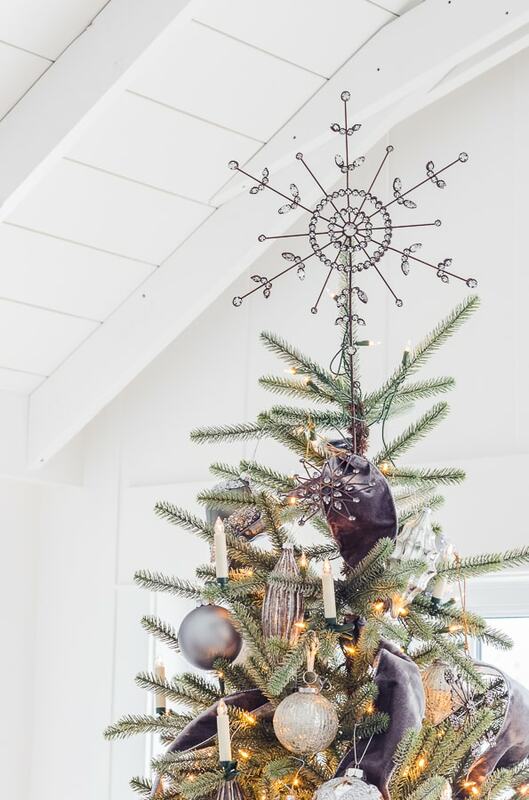 Balsam Hill’s 9 ft Sanibel Spruce was the perfect tree choice for our space. I have never seen a more realistic looking tree! The shape and color are perfect. 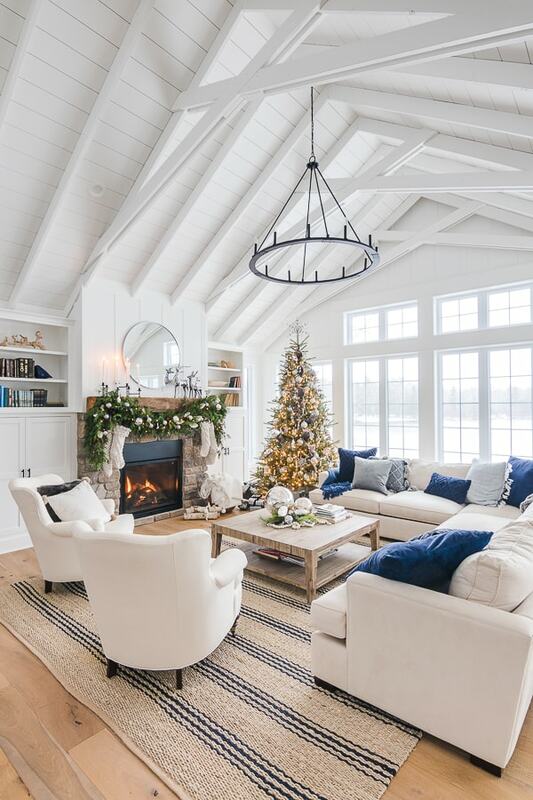 The irregular branches really give it a classic vibe. Not to mention this is the absolute easiest tree I have ever set up in my life. There was no fighting with lights or trying to match up plugs. This pre-lit version has sections that just insert into each other with the plugs built right in. Balsam Hill’s trees also come with really nice storage bags to keep them safely stored the rest of the year. 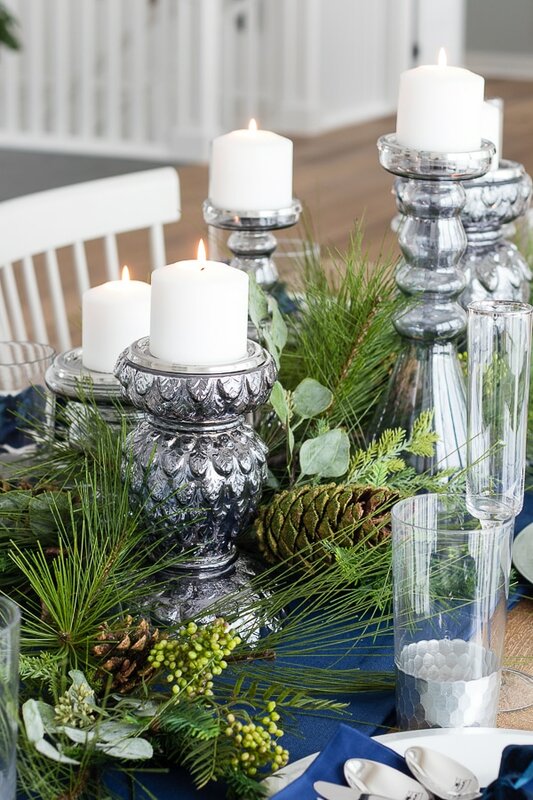 In keeping with that classic theme, I picked out these beautiful mercury glass French Country ornaments. Along with this Antiqued Snowflake Ornament set. 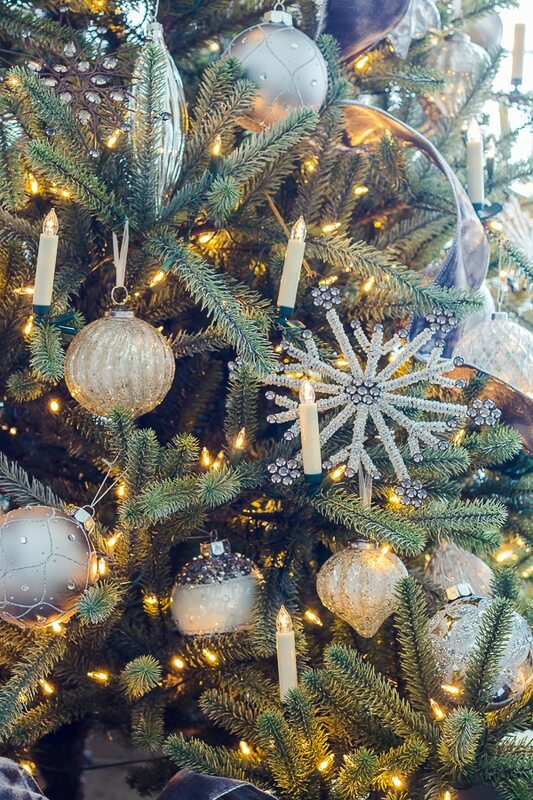 My photos don’t begin to do these ornaments justice – they are so, so, beautiful. Even my 7 year old son oohed and ahhhed when we placed the Antiqued Snowflake Tree Topper on the top of the tree. Mixed in with the mercury glass ornaments and the snowflakes, I added the Crystal Palace Glass ornament set. 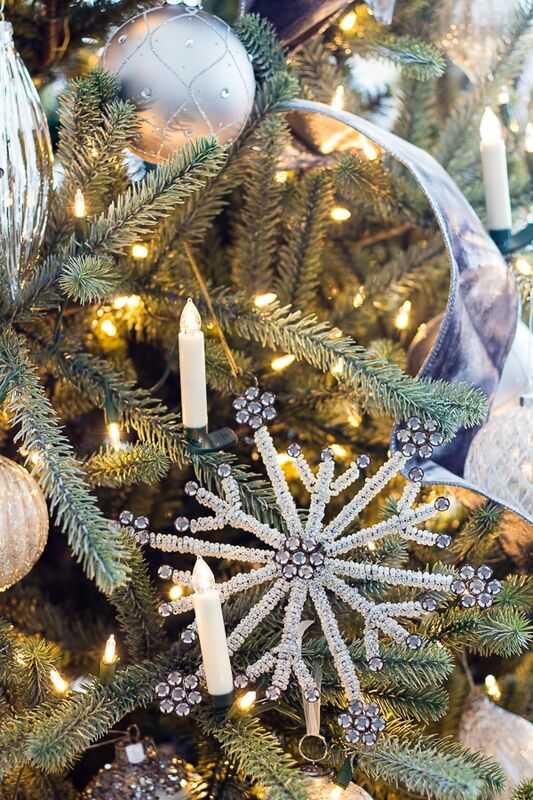 All the unique shapes and silver tones of these ornaments make them feel like vintage ornaments I have collected over time. They really feel like something my grandma would have passed down. The gorgeous Silver and Platinum Christmas Tree Ribbon I tucked into the tree added to the metallic theme. 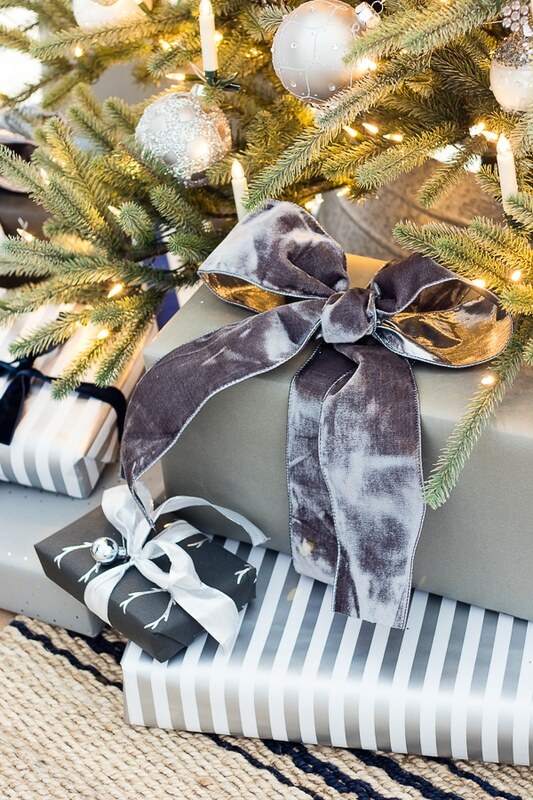 Velvet is a huge trend this season from fashion to home decor, and this ribbon could not be prettier. I talked about my love of these fun Color Changing LED Christmas Tree Candles a few weeks ago, and they are the perfect finishing touch to my classic tree. My kids have been loving changing the colors every day when they get home from school. 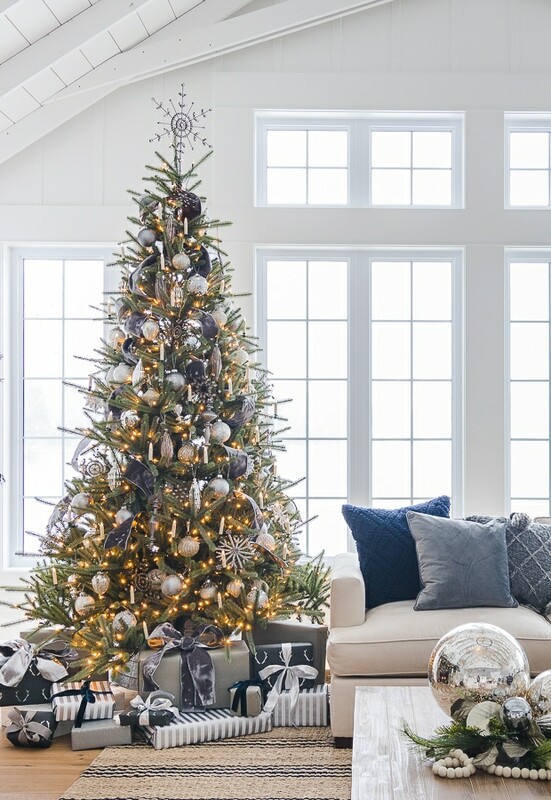 I love the fact that all of these silvery ornaments will easily transition with whatever Christmas theme I decide to go with next year. Many thanks to Balsam Hill for partnering with me on this project. 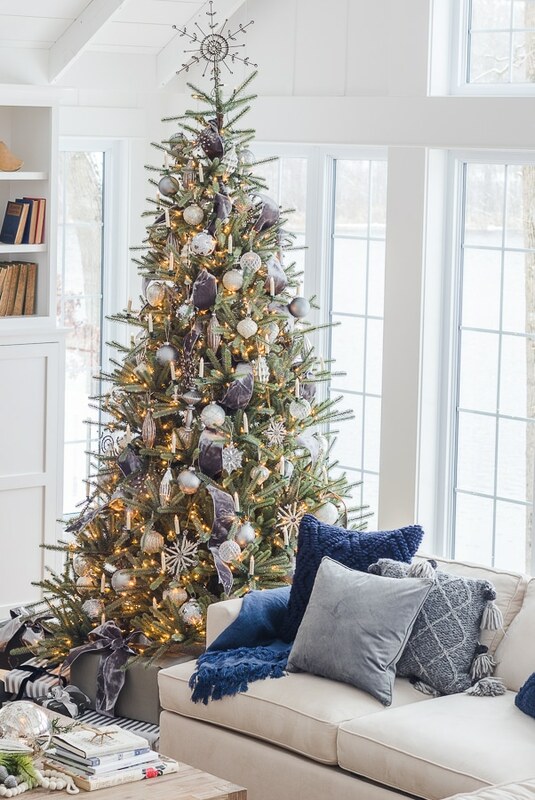 I’m so excited for the cozy classic tone this tree has set for our Christmas this year. I can’t wait to share the rest of our home decked out in the next few weeks! 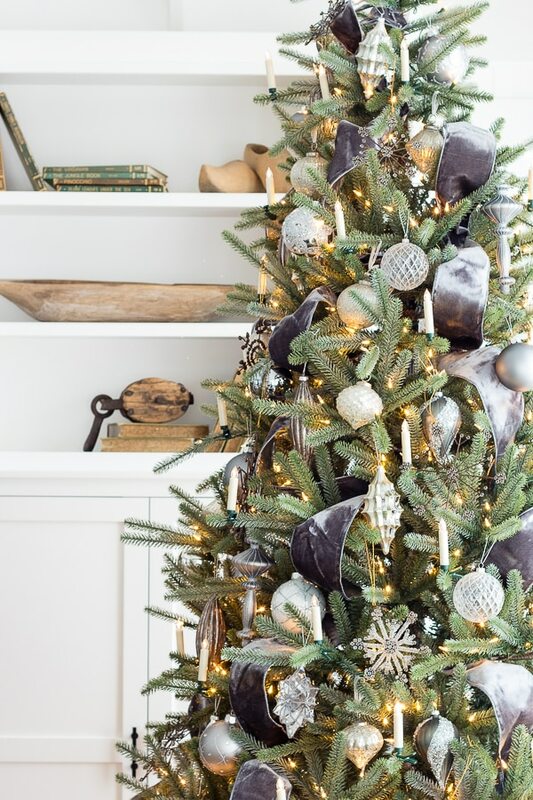 Be sure to check out all of the other gorgeous trees from my fellow bloggers below! Are you all early Christmas shoppers? I try to get it all done early, because I always need presents under the tree for photoshoots. Although, I do enjoy torturing my children with empty wrapped boxes under the tree to keep them guessing. ;) There needs to be a support group for spouses and children of bloggers who are constantly subjecting their families to pumpkins in summer and Christmas at Halloween. I feel like as my kids get older it’s getting harder and harder to find them fun Christmas gifts that aren’t electronics. I’m kind of a stickler about their screen time. Just ask them…they will tell you about the unfairness of it at length. If you are in the same boat as me shopping for older elementary kids, I’m sharing a few things that I have found for them this year that I think they will love. Slow Rising Jumbo Squishies – I have to admit I do not understand the obsession with these squishy things, but she loves them and so do all her friends. You basically just squish them and watch them inflate again. Yep, that’s it. That’s all they do. These ones are super cute at least. Choose Kind Journal – My daughter is an avid reader and she loved the book Wonder. I love the concept behind this Wonder Journal. It’s a kindness journal with prompts each day to do a little random act of kindness with space to write about it. Just Between Us Mother Daughter Journal. I love this concept, it’s a journal you pass back and forth with your daughter with different discussion prompts. My daughter is not always comfortable sharing her feelings or thoughts, but sometimes she will write me notes or letters. I’m hoping this will be an easier method of communicating thoughts or feelings she may be uncomfortable about. Or she could roll her eyes at me and say Mo-ooom, but we shall see! Alex Glitter Gel Pens – I find she is more receptive to writing in a journal if she has fun pens to use. I will pair this with the journals for a fun stocking stuffer. Alarm Clock Speaker Nightlight – Ok, this is like the coolest nightlight/speaker/alarm clock/party in a box. I may not let my kids have a ton of screen time, but they are allowed unlimited music time. I have an app on my phone (read about it here) where I can control what functions they use on their devices. I can shut everything off except her music. She is always wanting to listen to music with her friends, so this is a great portable bluetooth speaker with the added bonus of color changing lights. This will be the hit of the next slumber party. It’s also an alarm clock and a fun night light. Bath Bomb Mold Set Kit – Last Christmas I bought her a kids bath bomb kit, which she loved, but it was geared towards kids and wasn’t the best quality. I thought this year we would try a legit bath bomb kit. You still need to buy some of the supplies, but it looks like the forms are much more professional looking. I can see her making these and wrapping them up for friends and family. Crayola Light up Tracing Pad – This light board has a ton of uses, but my daughter loves to draw clothes and make up fashion designs. I can see her using this over and over to draw clothes on different doll forms, etc. Alex Spa Hair Chalk – This is always my daughters favorite thing to do at play dates. She loves to get creative with hair designs with her friends, and this washes out easily when they are done. Jumbo DIY Clear and Fluffy Slime kit – I don’t know any kid between the ages 7 and 13 that aren’t slime obsessed (put this right up there with the squishies, in things I don’t get). What I like about this kit is that it comes with a box to keep everything contained. This is one of those things that I will hide out of sight and bring it out when I can supervise and put it all back again when we are done. Hopefully avoiding any slime mishaps, cross your fingers for me. Ok onto my 7 year old son. Basically his whole goal in life is to take things apart and put them back together again while asking a bazillion questions in the process. I found lots of cool building and STEM learning type options for him. Lego Classic Large Creative Brick Box – My kiddo is lego obsessed and while he loves building specific sets, he also loves making his own creations. With 790 pieces, it has everything he needs to make whatever his brain can dream up. Klutz LEGO Chain Reactions Craft Kit – This kit has instructions to build fun machines and ramps to create different chain reactions. Warning, you need more lego pieces than this kit comes with so this may be a good gift with the big box of legos. Or for a lego lover who has a large collection of legos. Klutz Lego Gadget set – This set gives you everything you need to build 11 gadgets and machines. 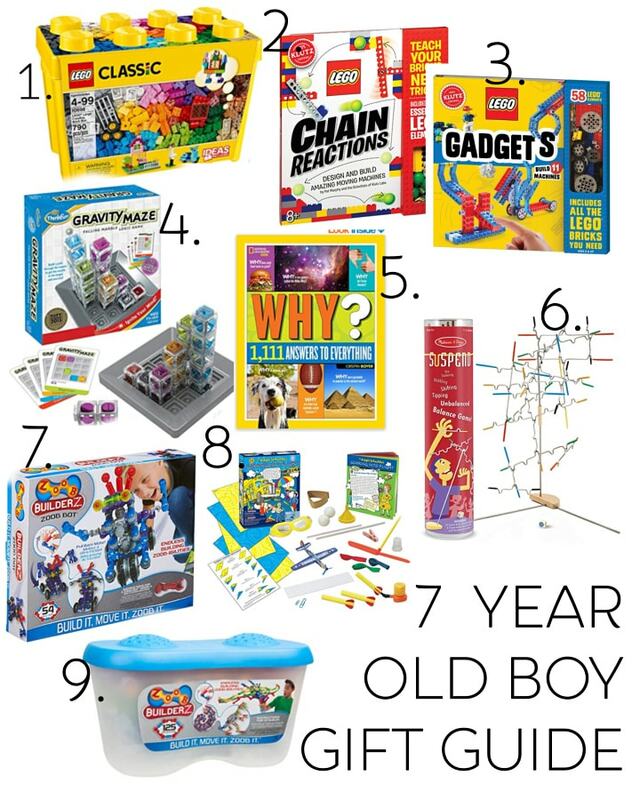 He is really into gears and pulleys and how things work, so he will love this set. ThinkFun Gravity Maze Marble Run Logic Game -This game is half marble run/ half logic game that is supposed to teach spatial reasoning. It has fantastic reviews and I think our whole family will have fun playing this. National Geographic Kids Why Over 1,111 Answers to Everything. If you have ever met my son, you may know why I need this book in my life ;) He loves to learn and is super curious, so I know he will enjoy all of the odd questions in this book. Melissa and Doug Suspend Game – We are always looking for fun family games, and I feel like this is a new jenga type game that our kids will love, plus it helps with hand eye coordination. Zoob Builder Zoob Bot – I haven’t seen these before, but I’m always looking for an alternative building type toy to legos and these look really fun and moveable unlike legos. This set builds a robot that you can actually play with and is kind of a beginner guide to robotics. Magic School Bus: Soaring into Flight – My little guy’s favorite show is Magic School Bus and he is always spouting off things he has learned. This little kit teaches all about flight with fun experiments with paper airplanes and parachutes. Zoob Builderz 125 piece kit – More zoobs! This set will expand any of the zoob kits and I can see my son building a million different things with these. It snowed! I thought we were supposed to get a light pre-winter dusting, but we got a full on winter wonderland with a good 4 inches. The good news is my kids had a blast playing in the snow all weekend long! 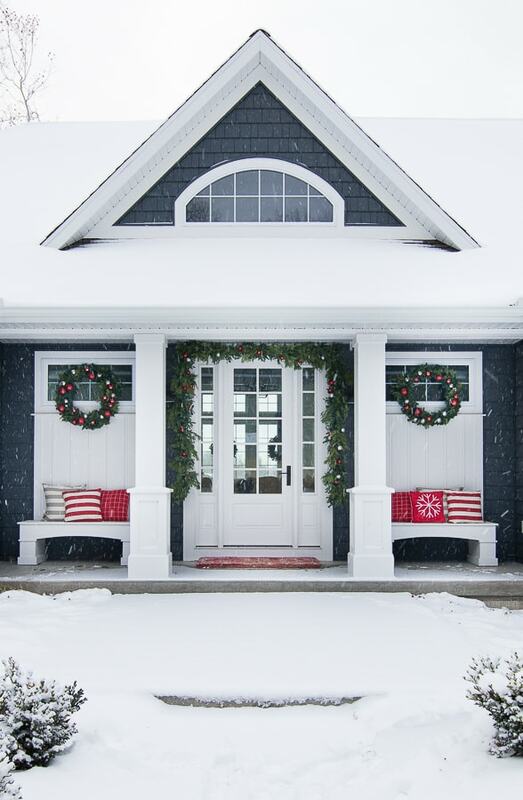 The bad news is, I didn’t finish my red and silver Christmas front porch before the white stuff coated everything. 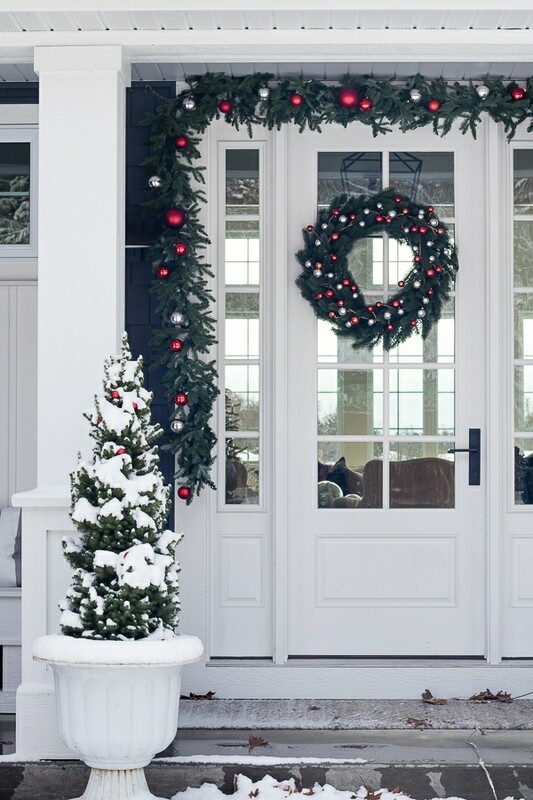 Christmas front porch ideas. So, here is my half done porch. It’s not really that far off from what I was planning though. 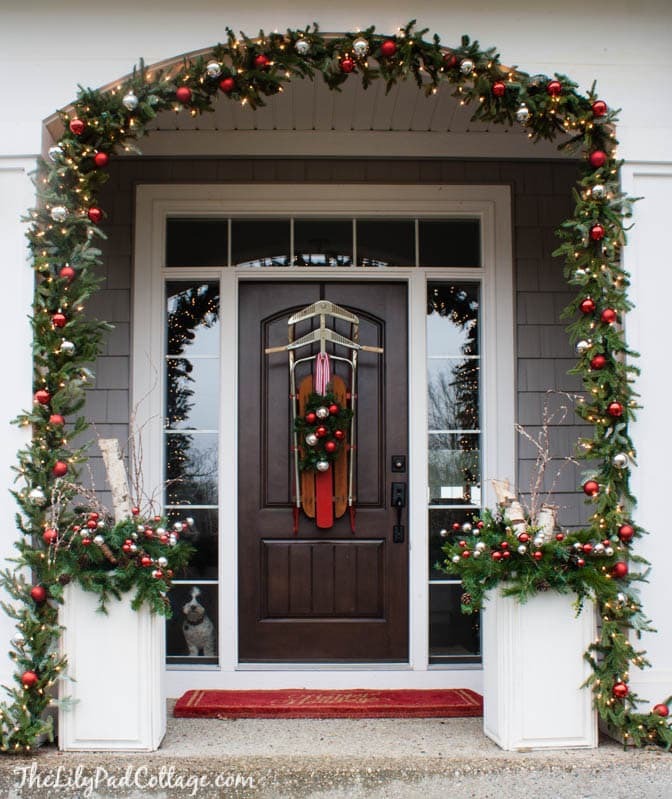 I’ve used this same garland around the front door the last few years, but normally I add in real greenery to make it look a little fuller. 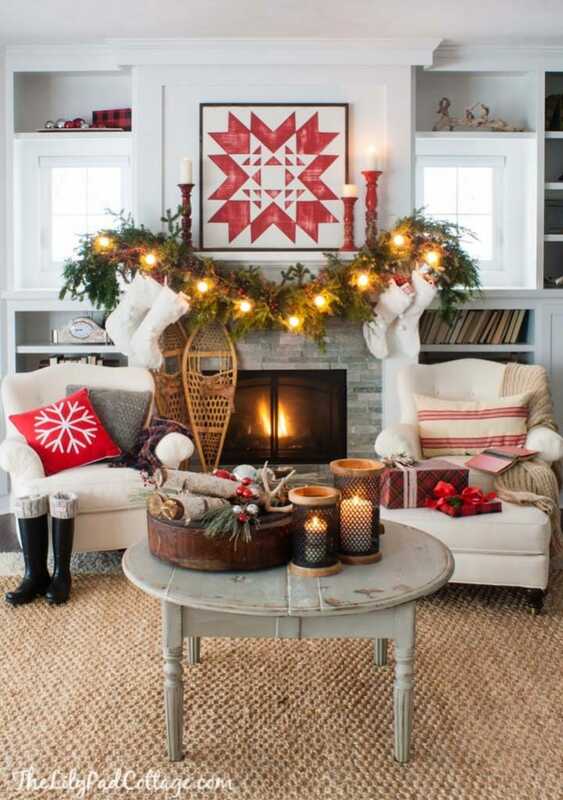 I still think it’s festive as is, and maybe if we get a heat wave (crossing my fingers and toes! ), I’ll add it in. I had a few questions on how I hung this up last year. I bought those small white nails and I nailed 4 of them along the top of our trim. Our trim has a pretty heavy wood texture, so this is one area where those sticky command strips will not help me out. The nails are small and our trim is white so they blend right in. In fact when I took the garland down last year I just left the nails right in place so they were already for me to use this year. Next, I use a spool of floral wire, wrapping it around the garland and then wrapping it around the nails. It took me about 5 minute to hang up! I also hung a wreath on the door this year. I have never hung a wreath on our door before because I thought it would bug me to look out at through the glass on the inside, but I actually don’t mind it. I just used one of those suction cup hooks, if the temps drop really far down though I’m not sure it will hold up to the cold. Red mini red ornaments added a pop of color to my new tree planters. You can just see them peeking through the snow. Also, notice all the leaves peeking through the snow! Ack, the trees are still filled with leaves too, so taking care of the leaves this year is going to be a soggy mess. My window boxes got a wintery dusting as well. My kids are so excited for the lake to freeze over, (which usually doesn’t happen until late December), but I’m not ready to stare at the bleak white blah out there yet. 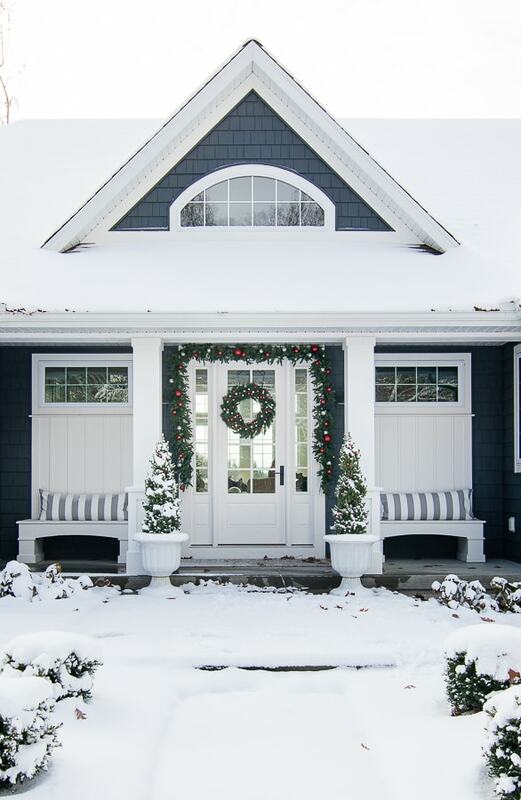 I did a little round up of all my past front porches, since this one isn’t quite complete. You can check them all out below! Here’s last year’s look. I’m so glad I’ve simplified the pillow situation on the benches. You can see how nice and full the garland looked because I added in the real greenery. Oh here is our old house! So many memories! 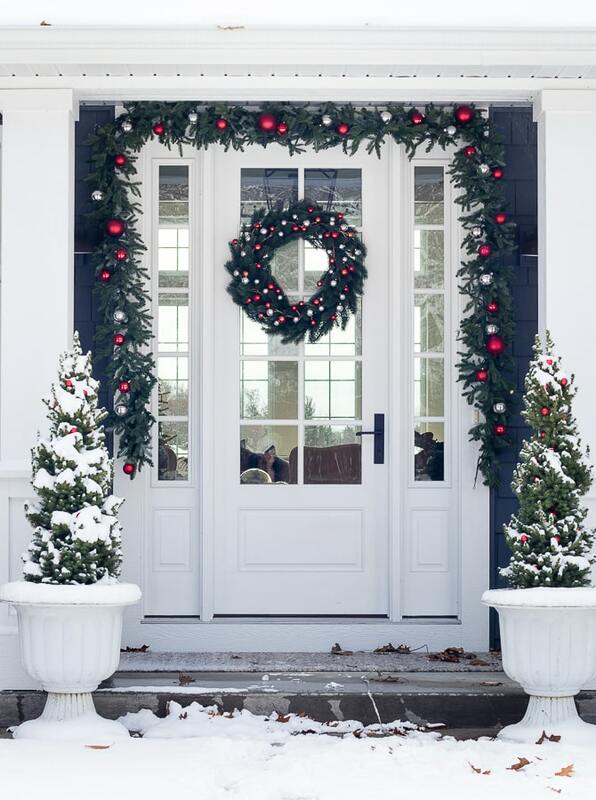 I loved this sled look on the door, but it definitely would not work on our new glass front door. Throwing it waaaay back with this one to 2012, and the year I decorated my parent’s house. 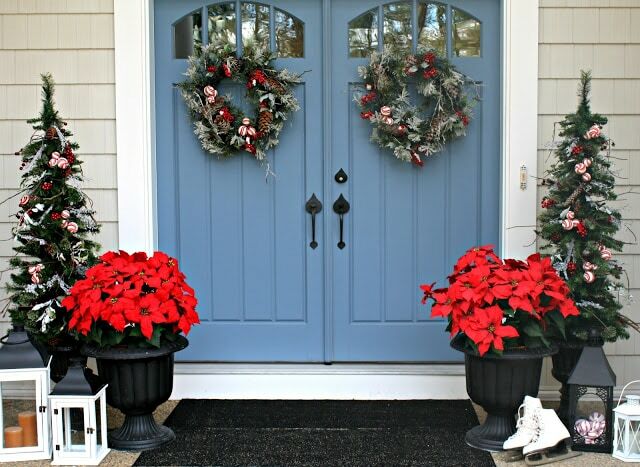 Their blue doors were so fun with the red poinsettias! Hope you all are staying warm where you are!